Yagi castle (八木城) is located at Shiroyama mountain, one of 300 meter height above sea level at the side of Saindoway road in Yagi town at northwest part of Hyogo prefecture. 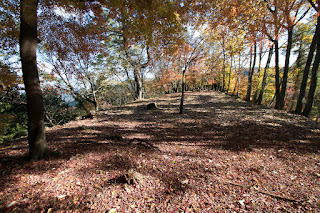 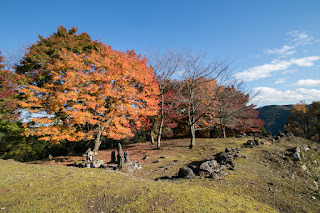 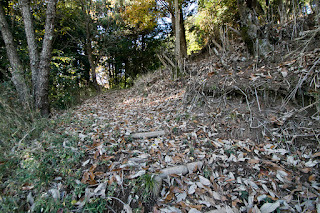 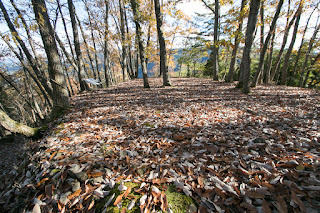 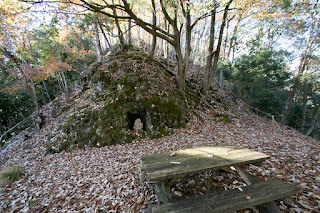 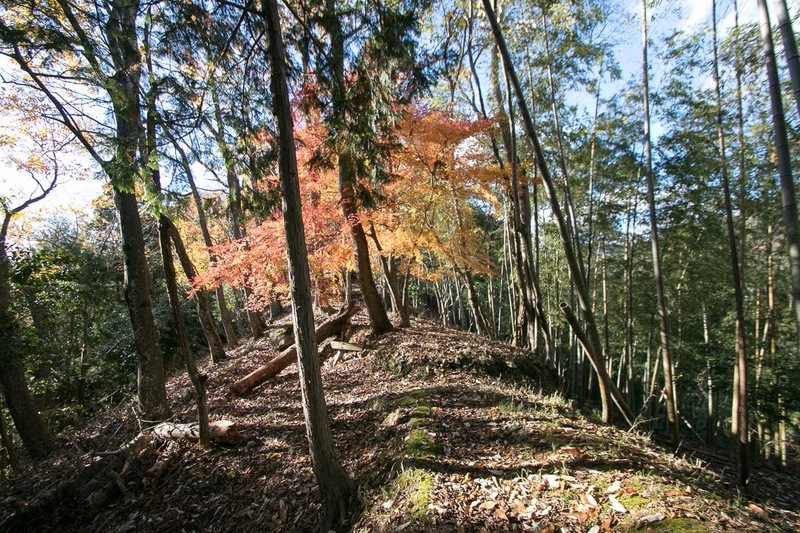 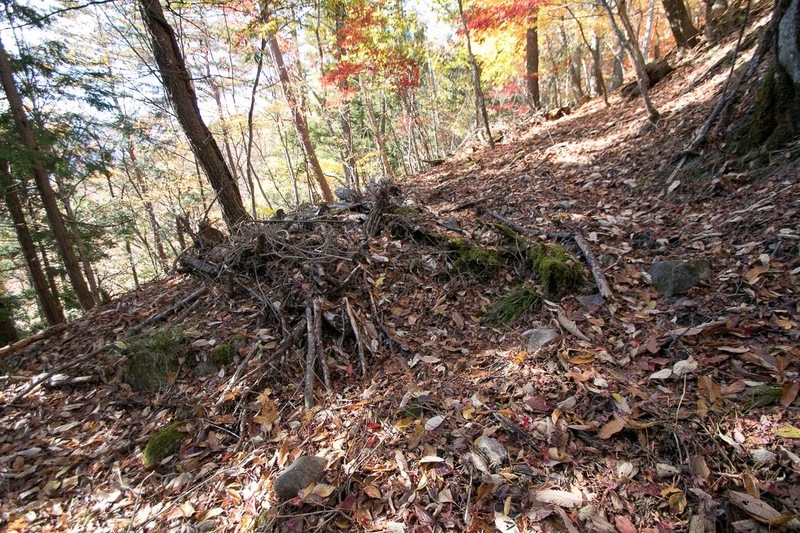 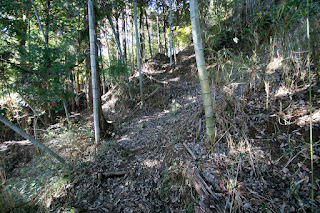 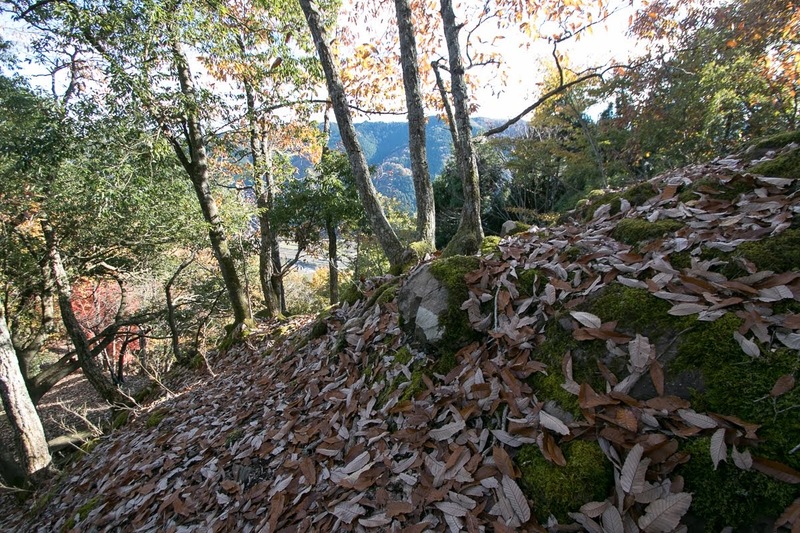 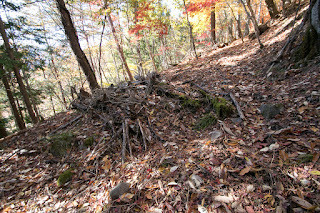 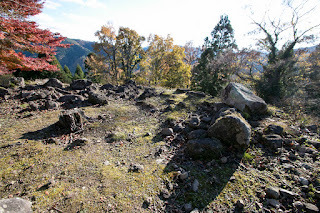 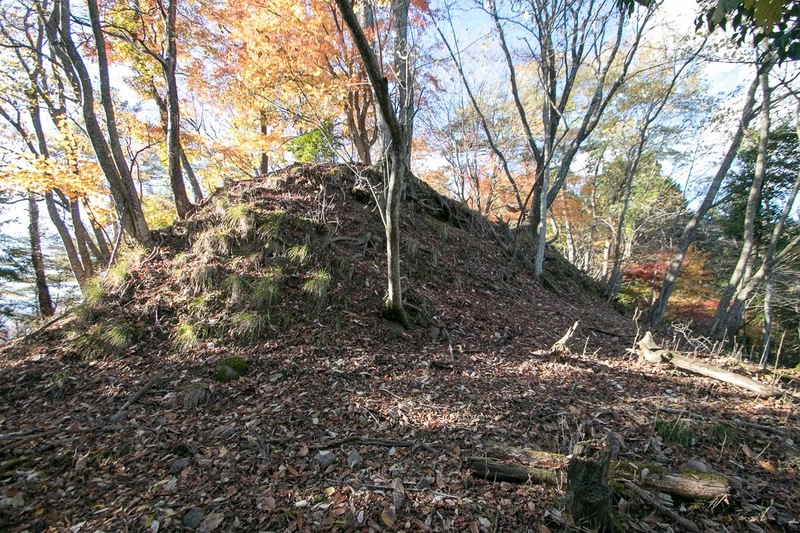 Shigoyama mountain is a part of long continuing ridge from Myokenyama mountain, and being surrounded by Yagigawa river and its tributary it is a good place to build a castle. 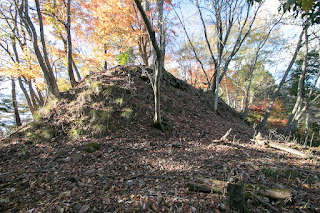 Inside of Shiroyama mountain there was much higher peak named Tsushishiroyama mountain, and this peak was originally used as a part of Yagi castle. 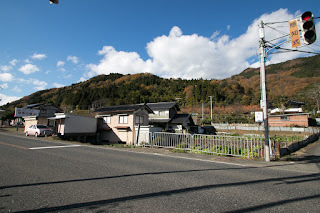 Sanindo road is a main route connected Kyoto city and Sanin region, and from Kyoto it passes Kameyama city, Fukuchiyama city and comes to this area. 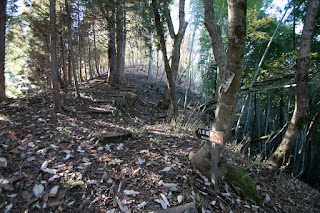 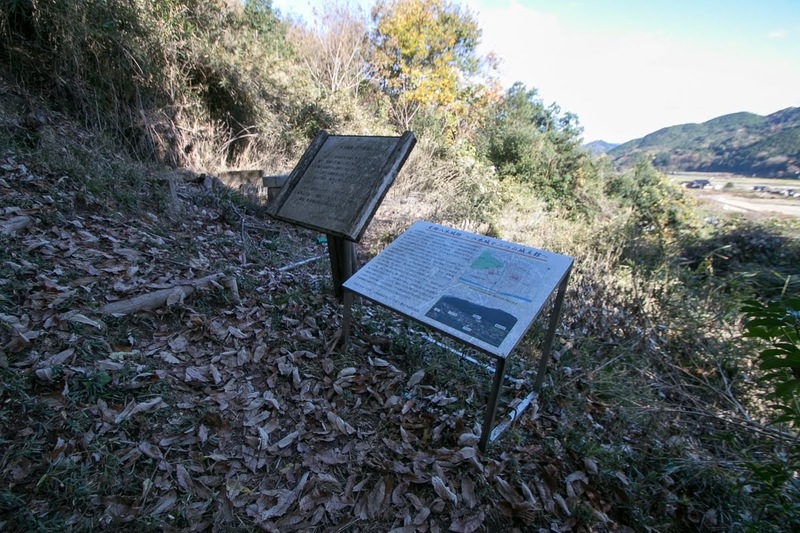 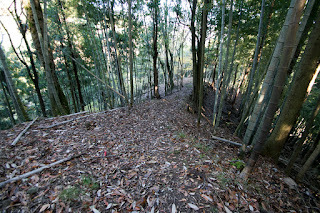 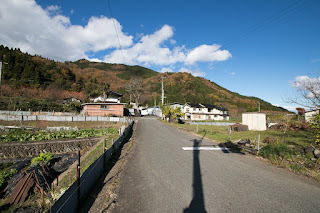 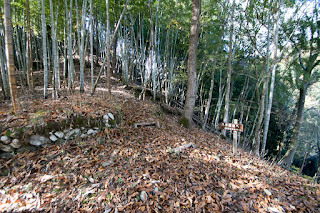 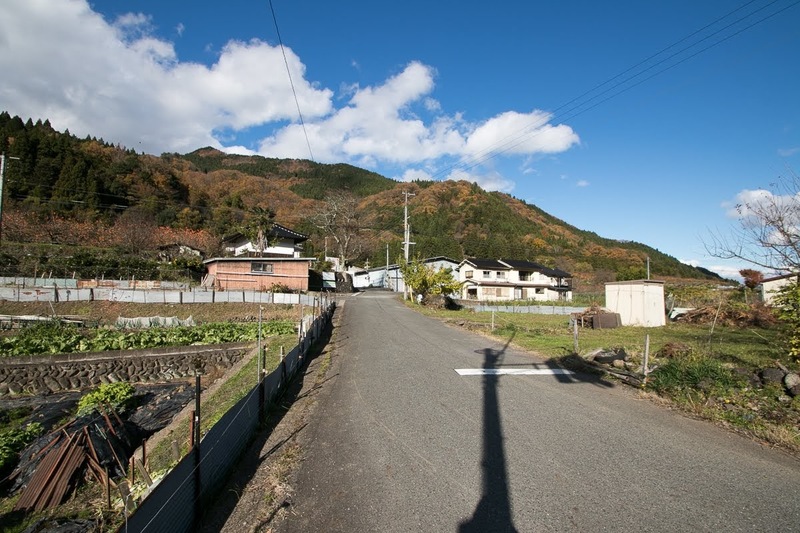 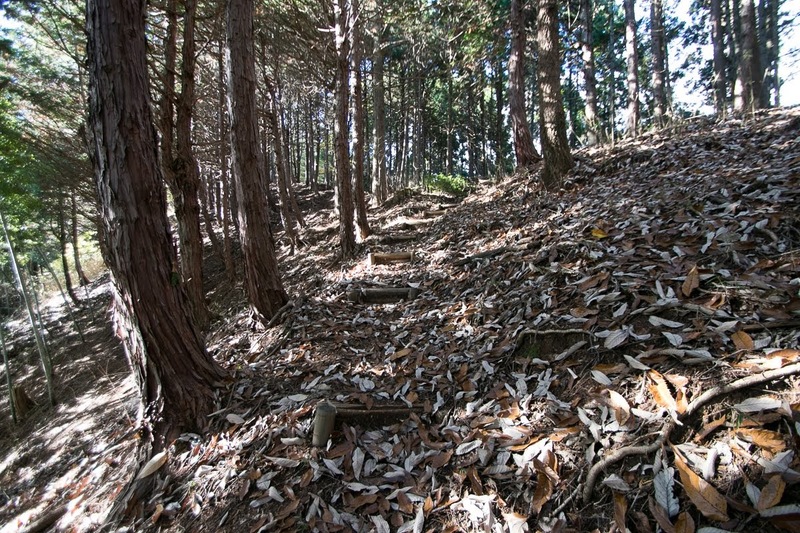 About 10 kilometer ahead of Yagitown Sanindo road passes Chugoku mountain and enter into Tottori area, the east part of Sanin region, thus Yagi area was an important border of Kinki region and Sanin region. 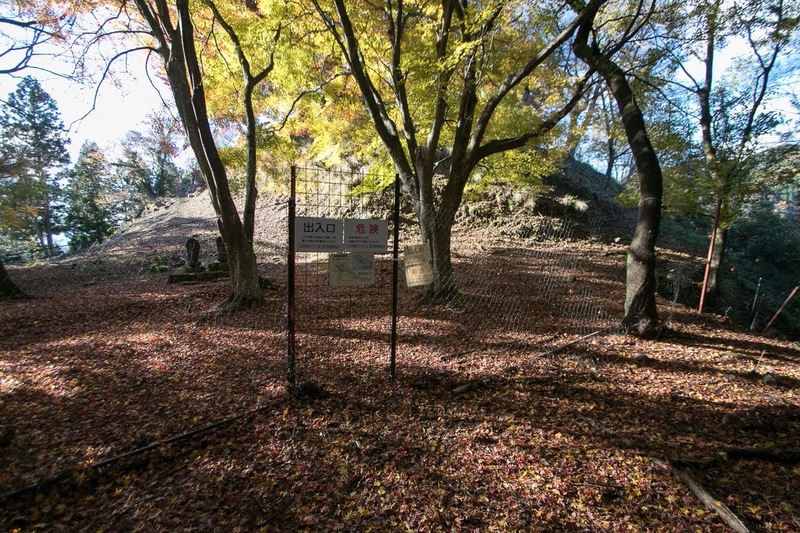 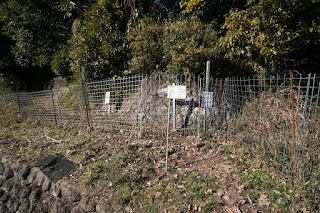 The fate of Yagi castle is highly affected by this geographical condition. Yagi castle is only about 15 kilometer away from famous Takeda castle (Hyogo prefecture), and the fate of both castle mutually related. 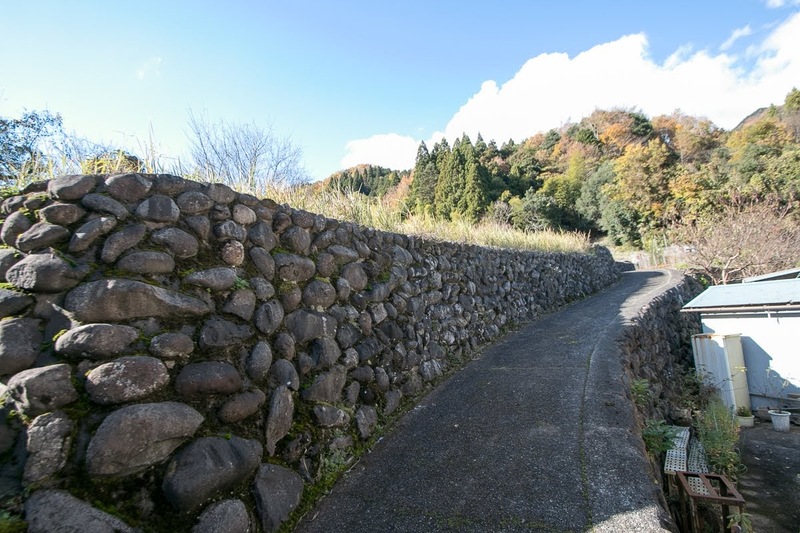 Yagi clan is said as a descendant of Kusakabe clan, a historical clan which stem from old Emperor. 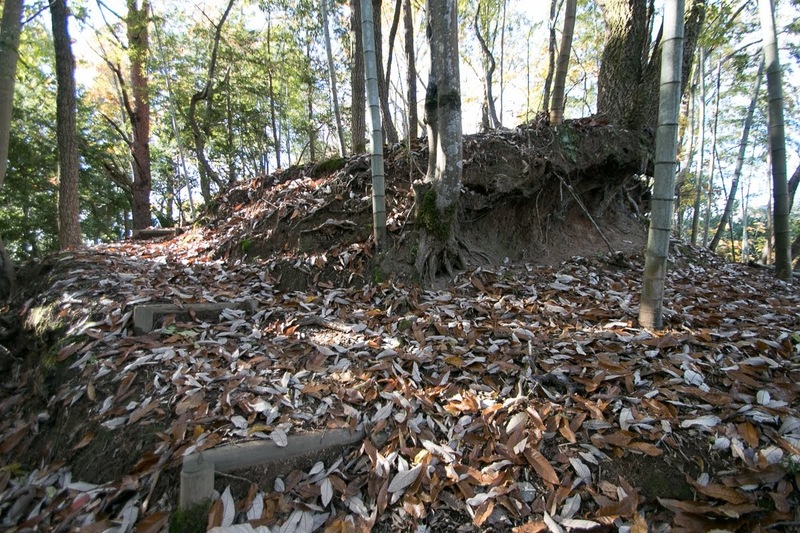 Among Kusakabe clan, Asakura clan which had the territory near Yagi town prospered, and later they moved to Echizen province (Fukui prefecture) and grew into a warlord of the province and prospered in the former half of 16th century. 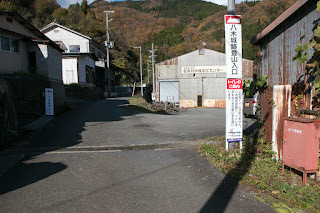 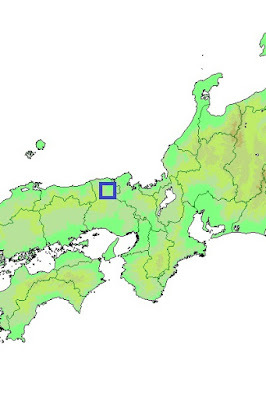 But some family of Asakura clan stayed at their original territory, and named as Yagi clan using the name of territory. 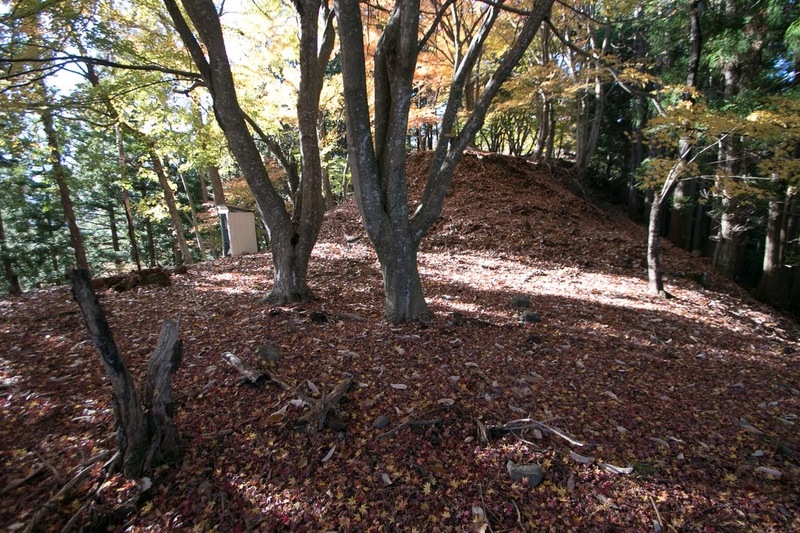 Yagi clan gradually grew their power and built Yagi castle as their residence. Tajima province (north part of Hyogo prefecture) where Yagi castle locate was governed by Yamana clan in Muromachi era. 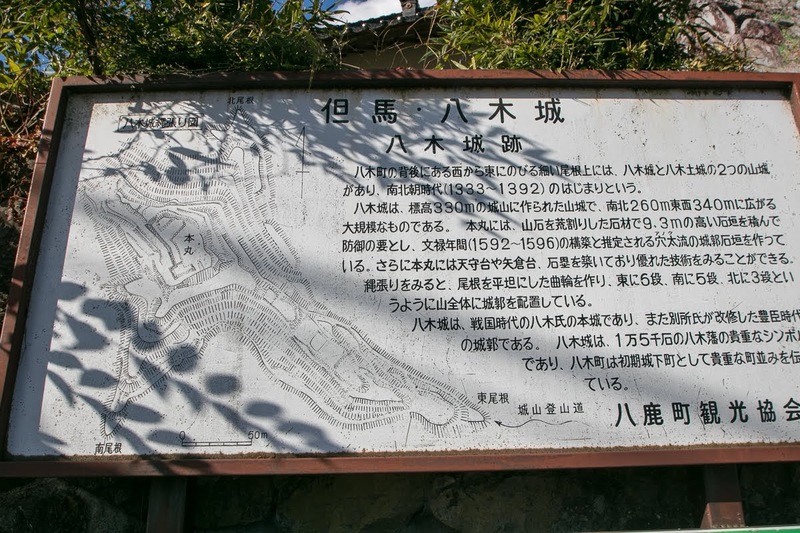 Yamana clan was a strong samurai family and relative of Ashikaga clan which was the house of Shogun at Muromachi Shogunate, thus at the beginning of Muromachi era Yamana clan managed 11 of 66 provinces of Japan mainly at Sanin region, and said as "one sixth lord". 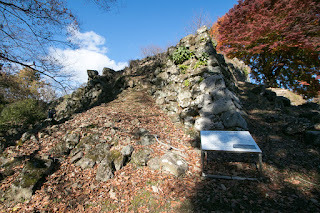 Being cautious of its power once Yamana clan was suppressed by Shogunate, but later Mochitoyo Yamana (1404-1473) regained its power and became the leader of one side at the battle of Onin. a long time continued internal war from 1467 to 1477. 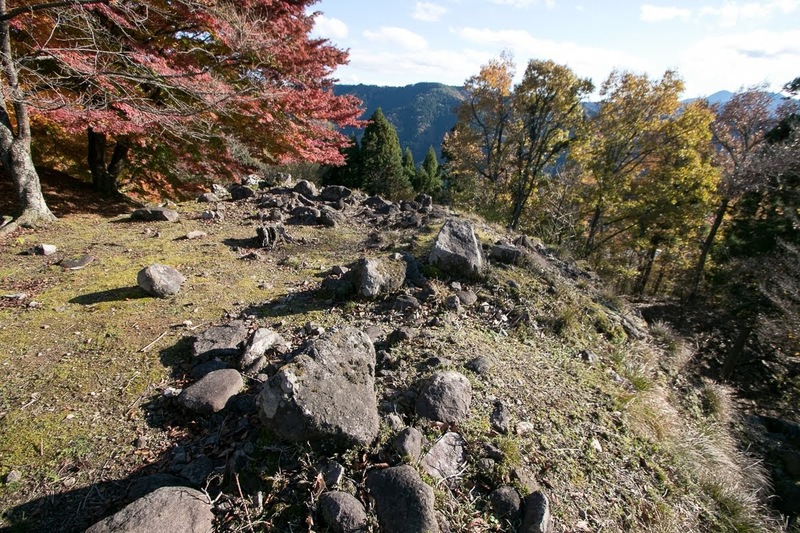 But due to the burden of the battle and internal conflict, Yamana clan rapidly lost their power after the war. Harima province (south part of Hyogo prefecture) was deprived by Akamatsu clan, and barely Houki province and Inaba province (Tottori prefecture) was kept but was suppressed by warlords such as Amago clan or Mouri clan. 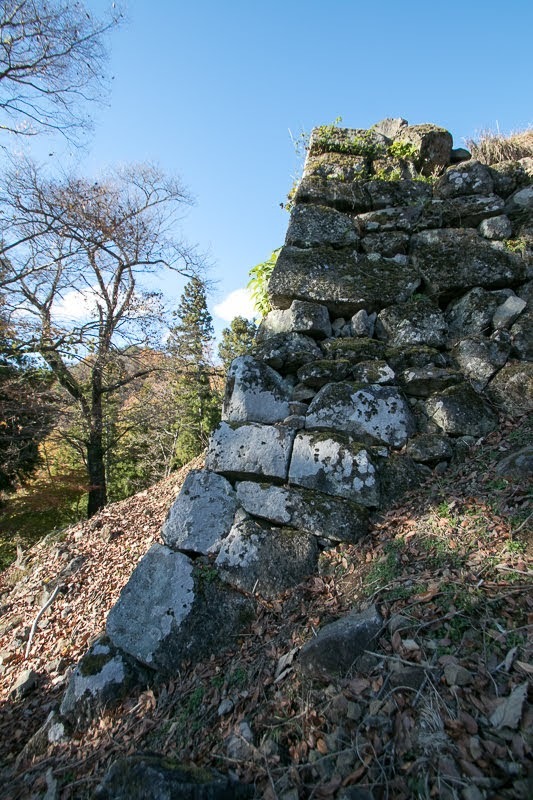 In Tajima province Yamana clan once lost its authority, and the power of the clan was affected by four major retainer such as Otagaki clan which was the lord of Tekeda castle, Kakiya clan at Toyooka castle (Hyogo prefecture) or Yagi clan. Around 1570, Tajima province became the border of Nobumaga Oda (1534-1582), a warlord of Owari province (western half of Aichi prefecture) which seized Kyoto area and became the ruler of central area, and Mouri clan which was the strong warlord seized whole part of Chugoku region. 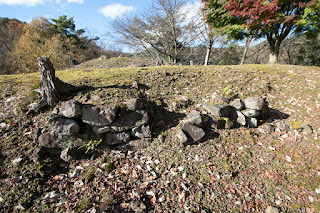 At first Nobunaga sent his general Hideyoshi Hashiba (1537-1598, later Hideyoshi Toyotomi) to Tajima province and once captured it in 1569, but once retreated to cope with enemies at eastern front. 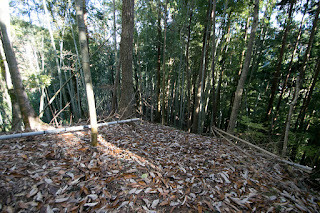 Utilizing this situation Mouri clan sent their army and forced local lords of Tajima province including Toyotobu Yagi (?-? ), lord of Yagi castle, to follow Mouri clan. But in 1577, Nobunaga who stabilized eastern front again started to conquer western area, and sent Hideyoshi Hashiba again. 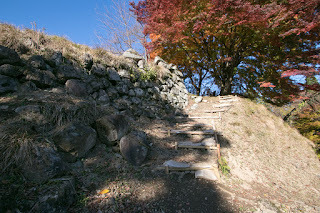 Hidenaga Hashiba (1540-1591), younger brother of Hideyoshi, attacked Tajima province again and again, and captured the province by 1579. 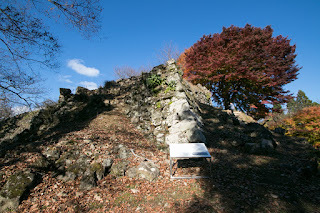 This time Toyonobu Yagi surrendered to Hashiba army, and was approved to hold Yagi castle. But next year Toyonobu participated in the first attack to Tottori castle (Tottori prefecture) by Hideyoshi Hashiba, and guarded Wakasa Onigajyo castle (Tottori prefecture) after that. 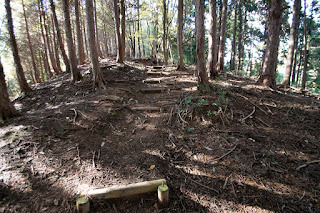 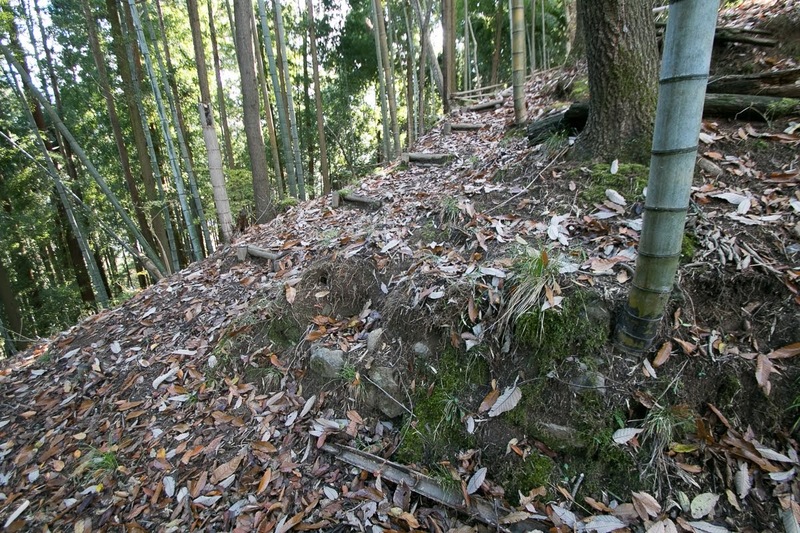 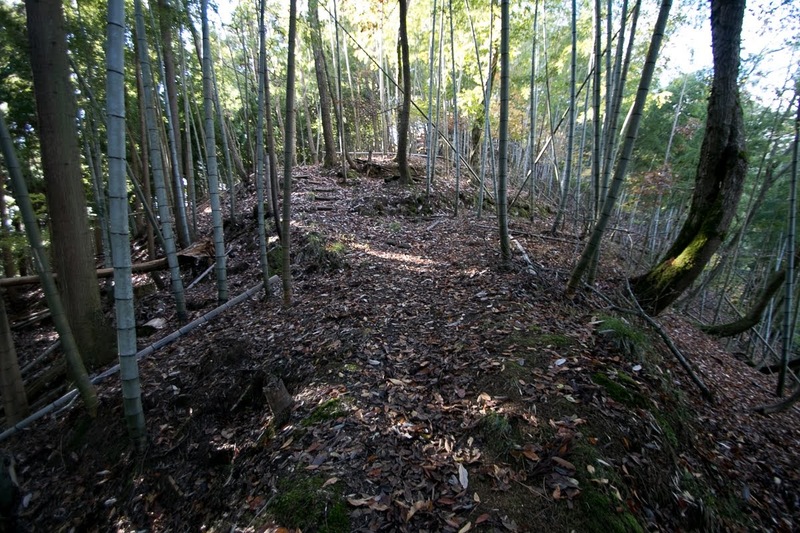 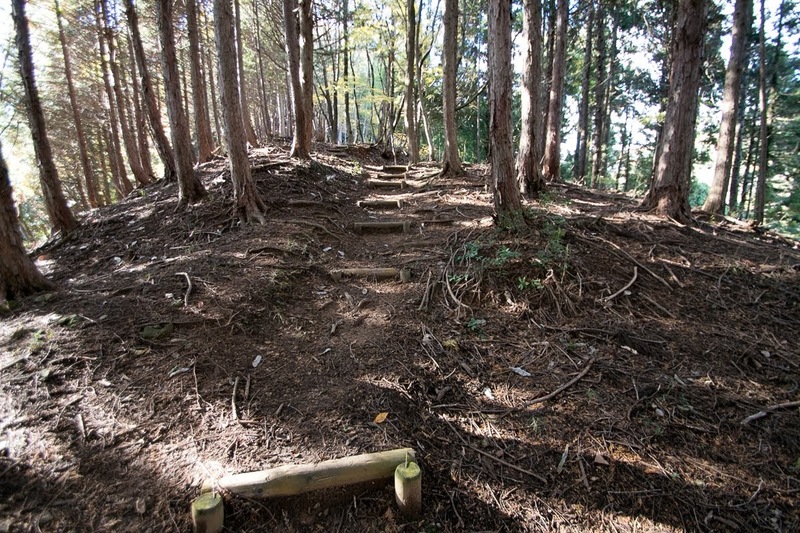 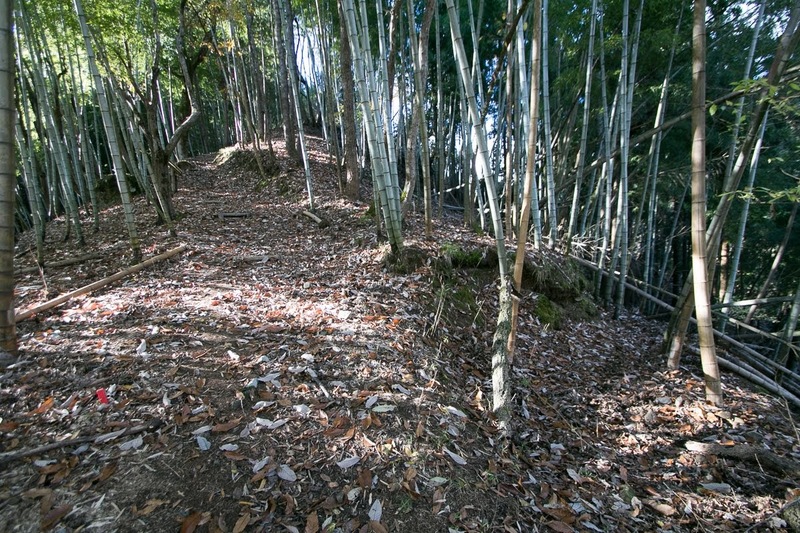 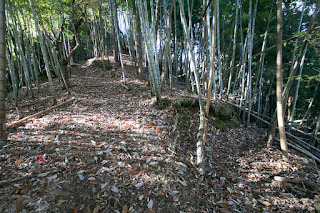 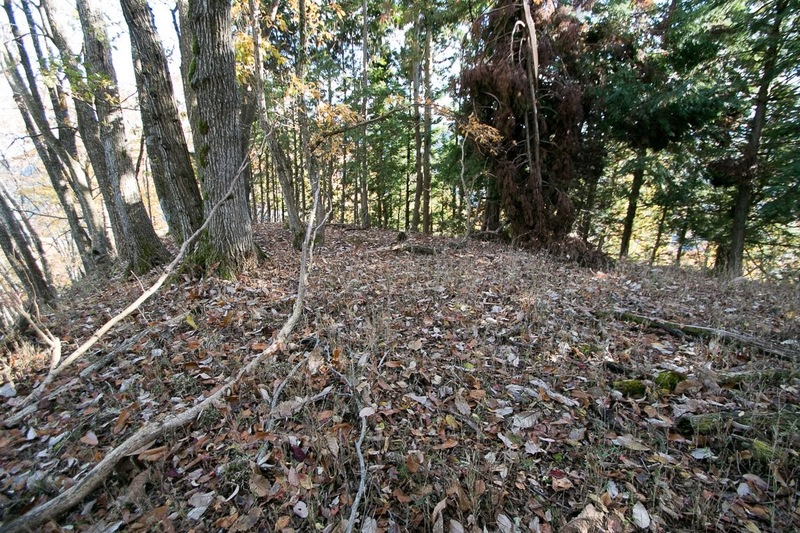 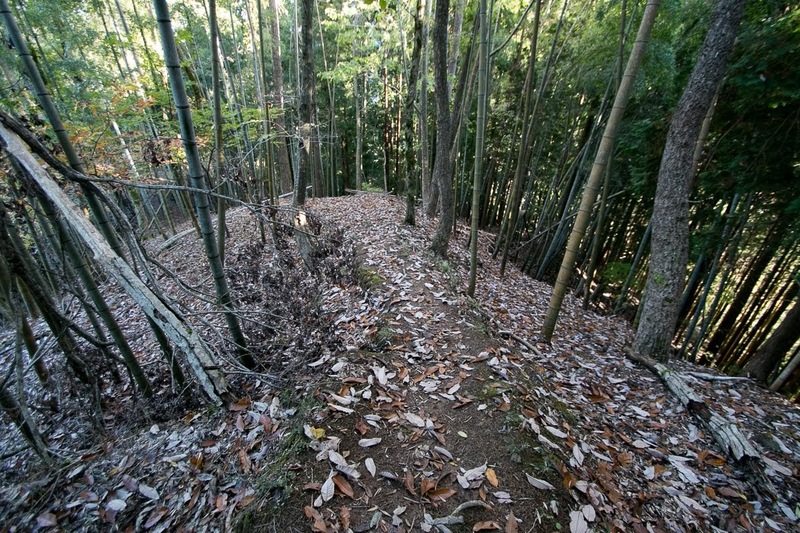 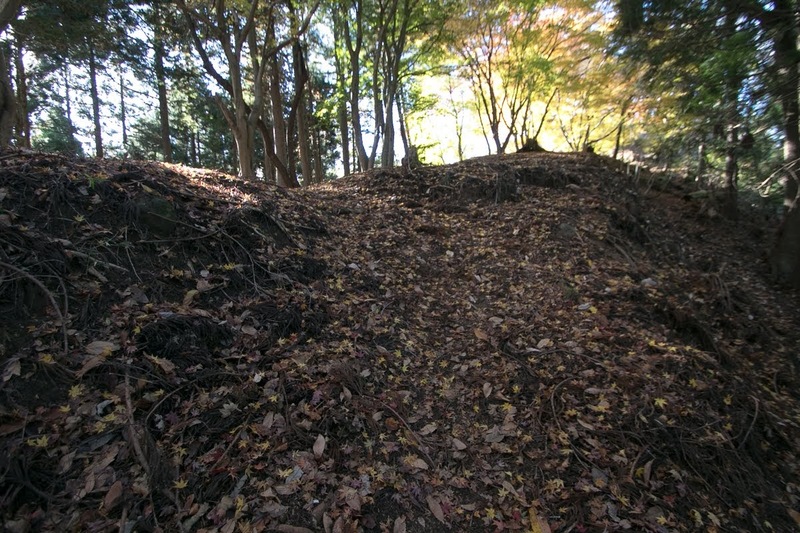 But facing the counter attack of Mouri clan, Toyonobu could not keep the castle and left then became missing. 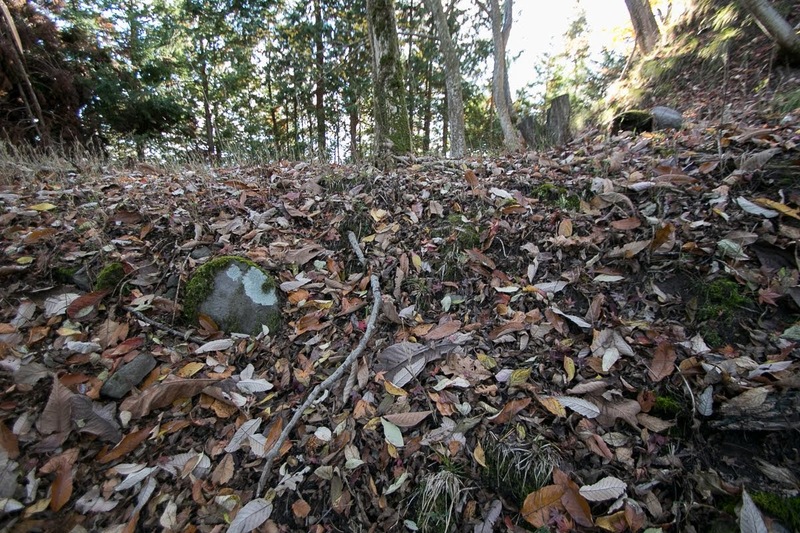 It is said that wandered Toyonobu became secretary of Iehisa Shimazu (1547-1587), a general of Shimazu clan which was the warlord of Satuma province (Kagoshima prefecture) far distant from Tajima province, but the truth of this story is still unclear. 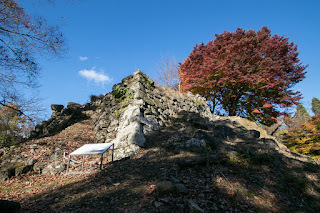 In 1585, under Toyotomi government, Shigemune Bessho (1529-1591) was appointed as a commander of Yagi castle. Shigemune Bessho was a person of Bessho clan which was eliminated by Hideyoshi Toyotomi at Miki castle, but Shigemune was originally close to Hideyoshi and was not involved in the battle of Miki castle. 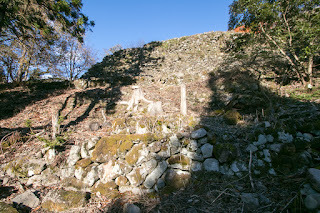 Shigemune reformed Yagi castle into the current shape. 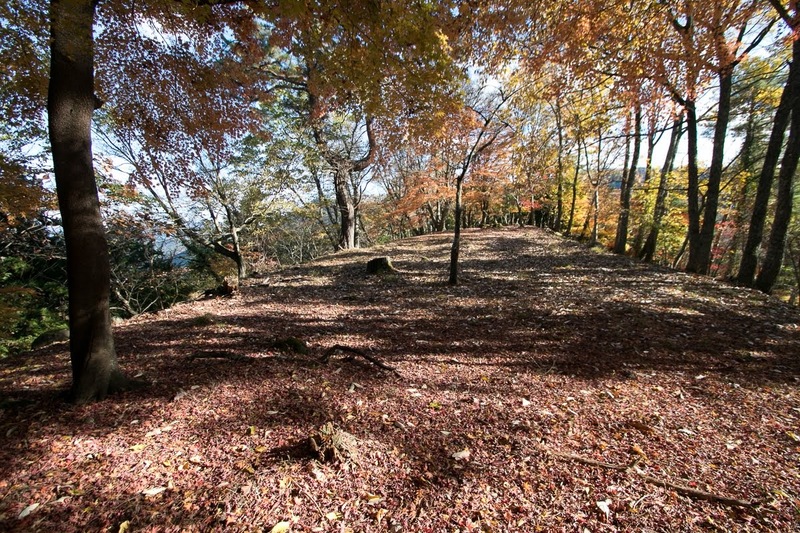 Yagi castle consist of central area and connecting terraces spread four directions from the central area. 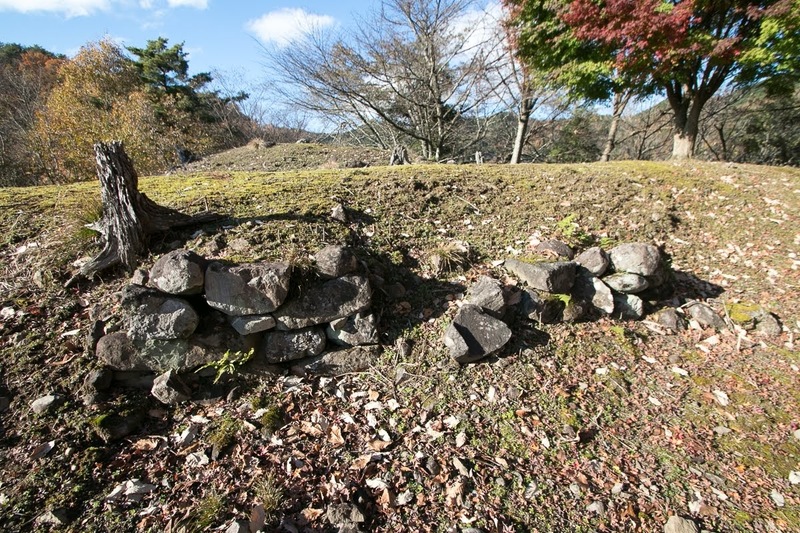 Central area is a 50 meter square area, and southwestern line which faces the castle town and Sanindo road were covered by stone wall. 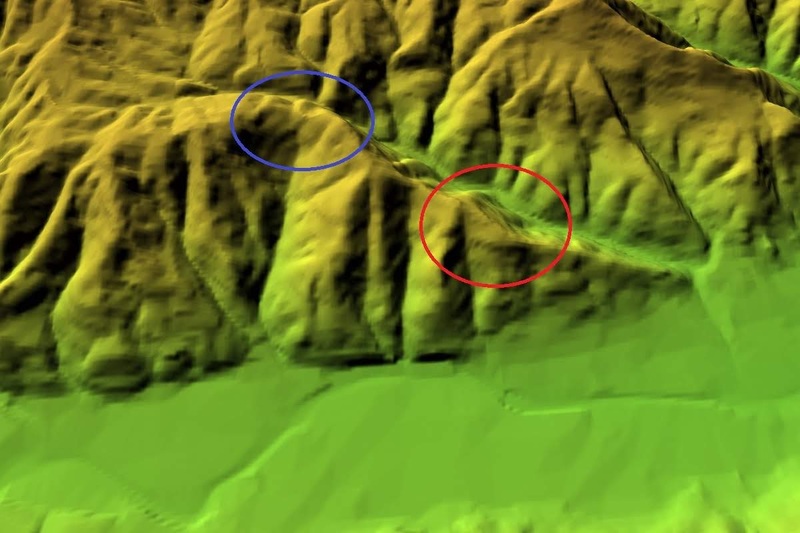 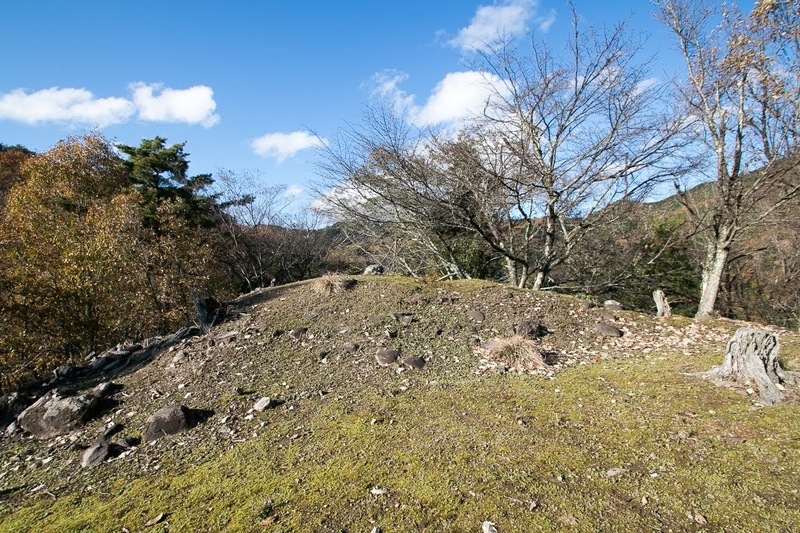 A small main tower might be built at the northwestern edge of the area, and another turret existed at the south edge. 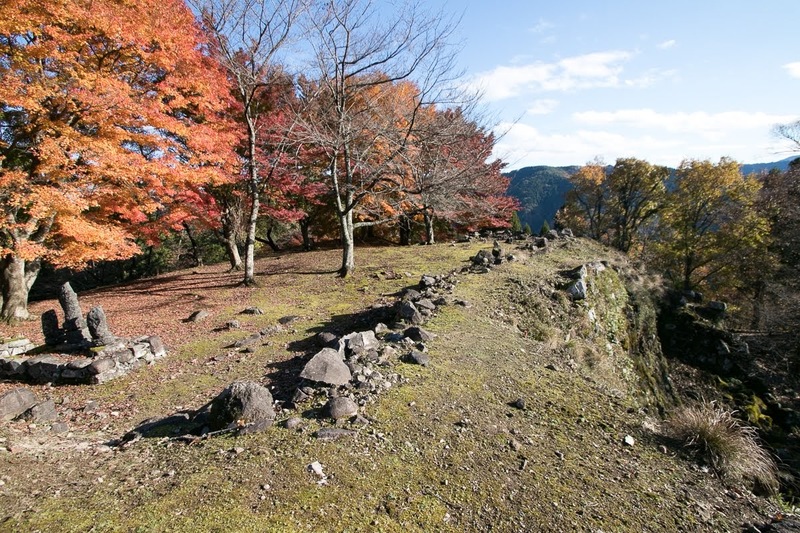 Terraces spreads on the ridges from the central area, and total size of the castle reached to 340 meter long and 260 meter width. 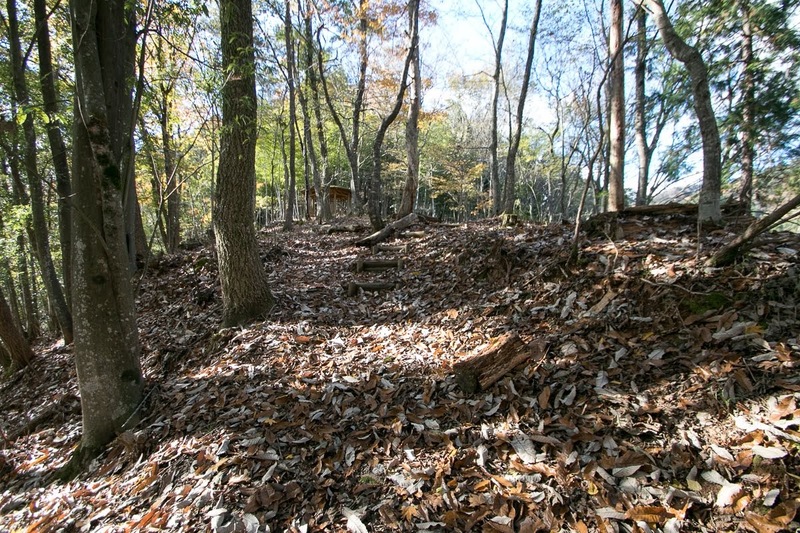 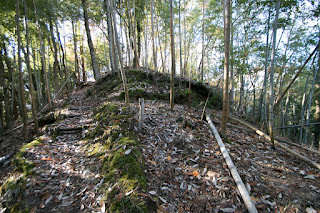 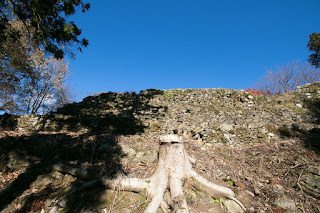 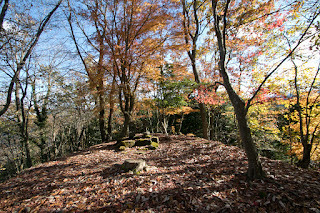 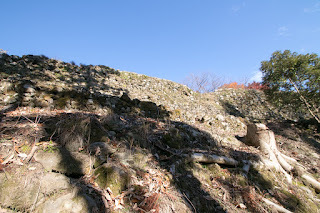 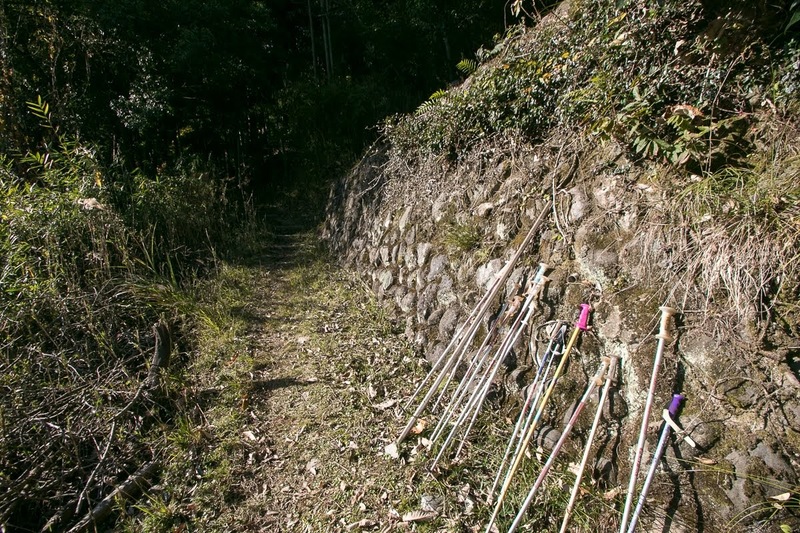 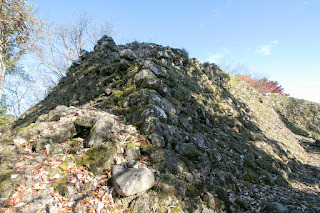 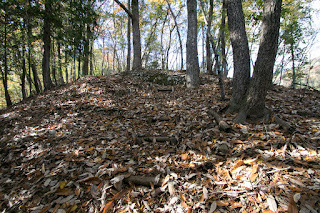 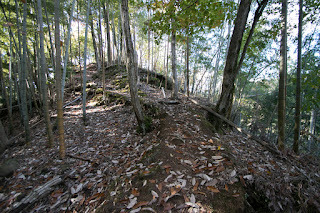 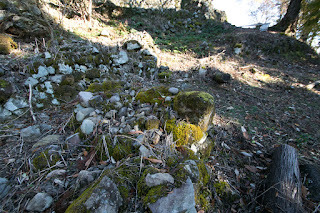 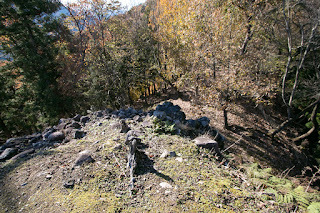 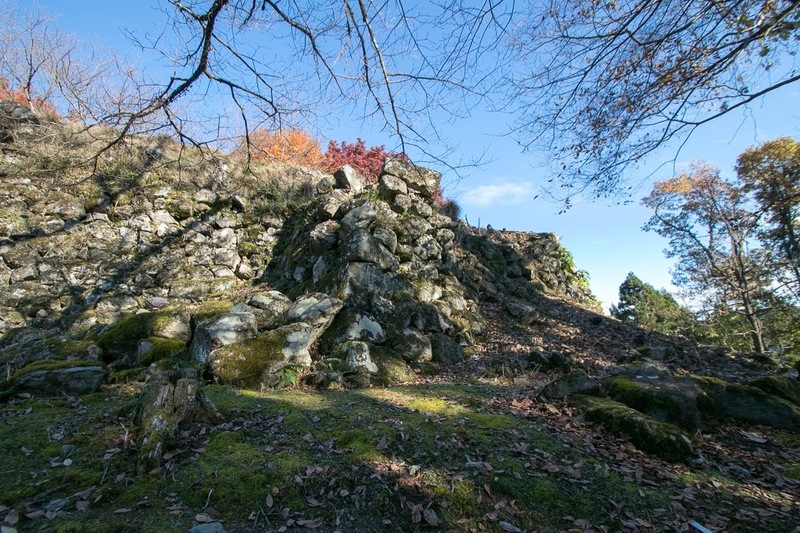 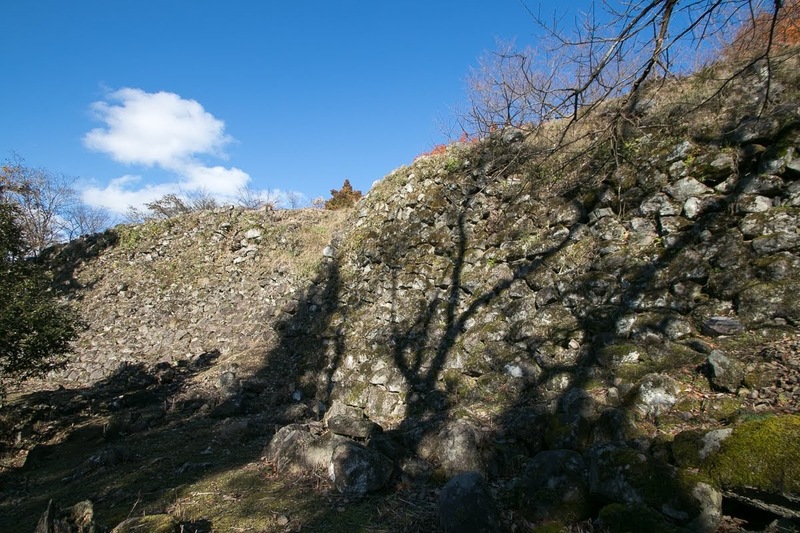 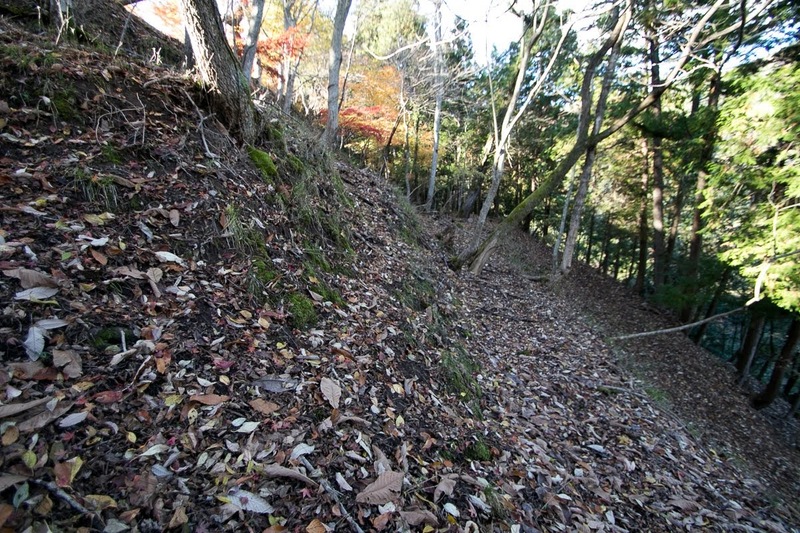 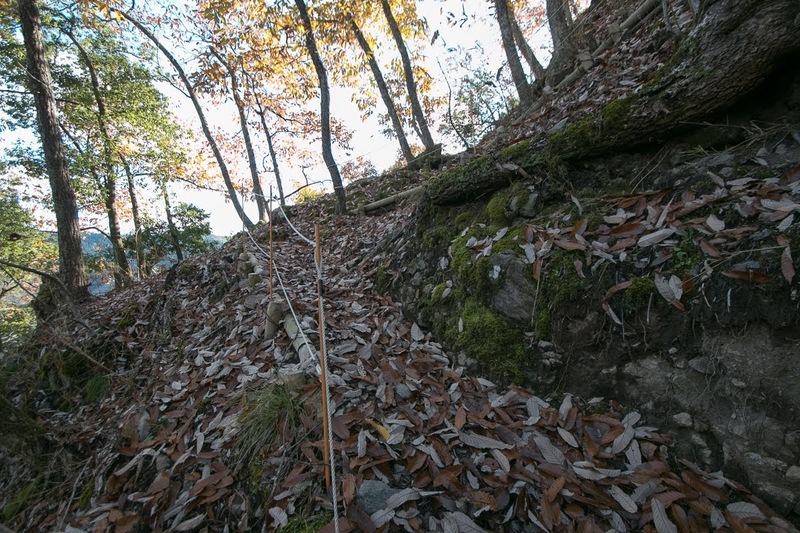 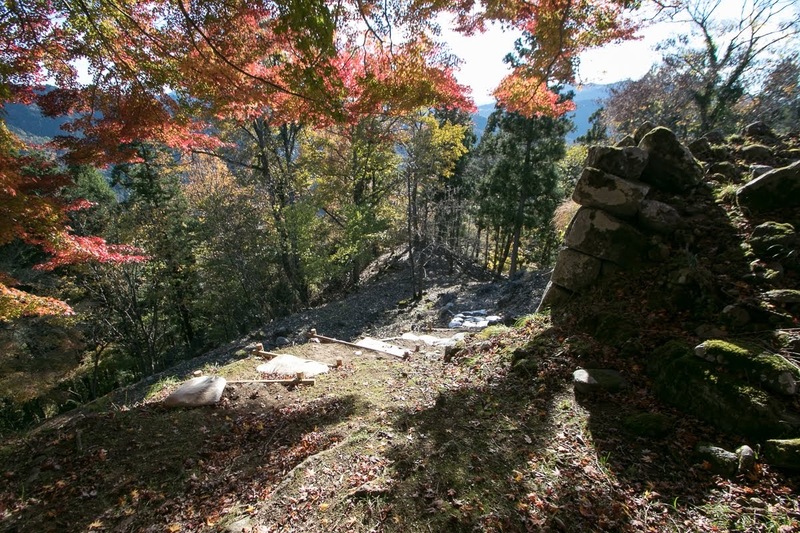 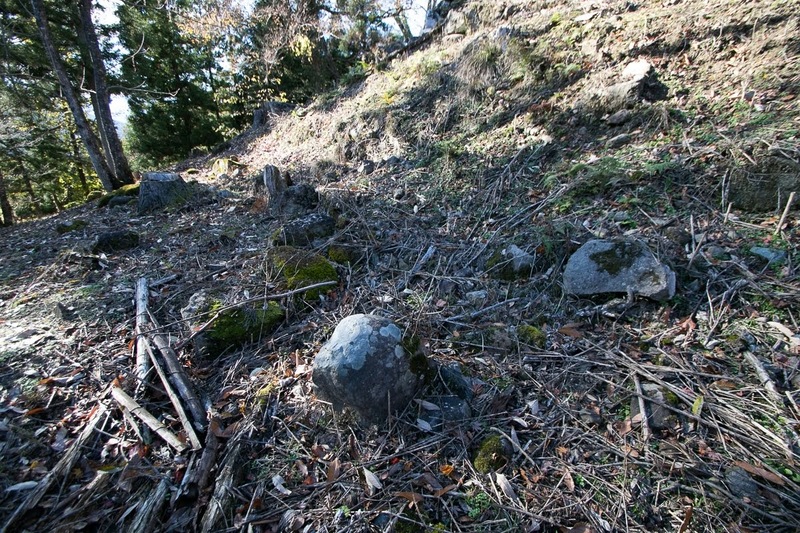 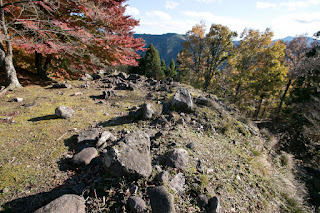 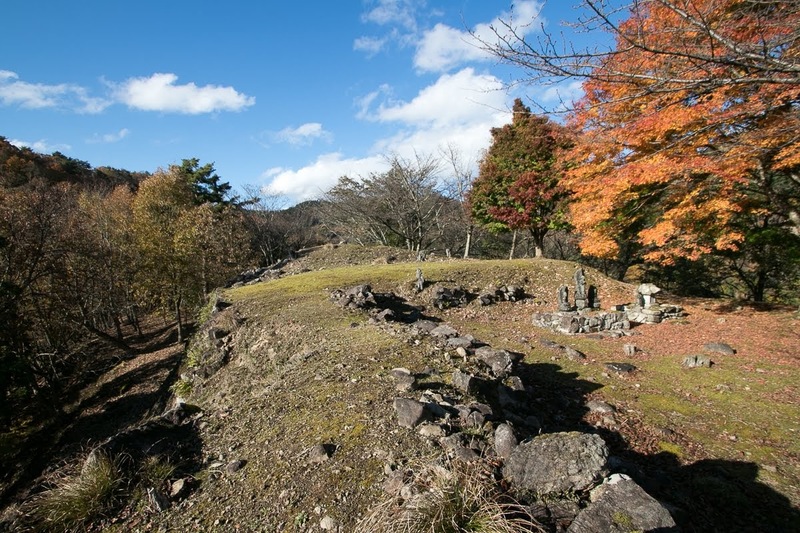 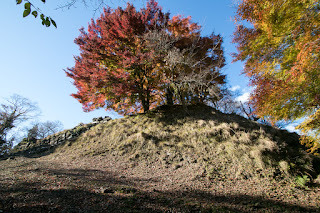 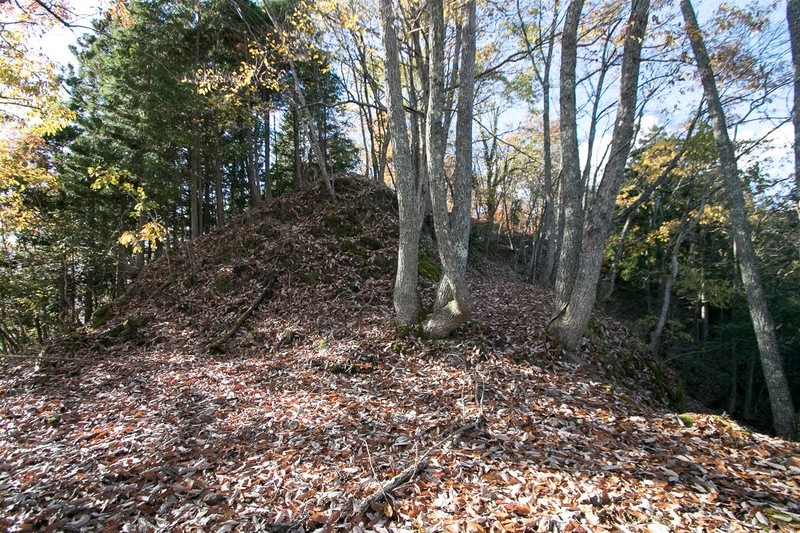 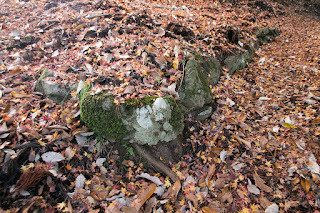 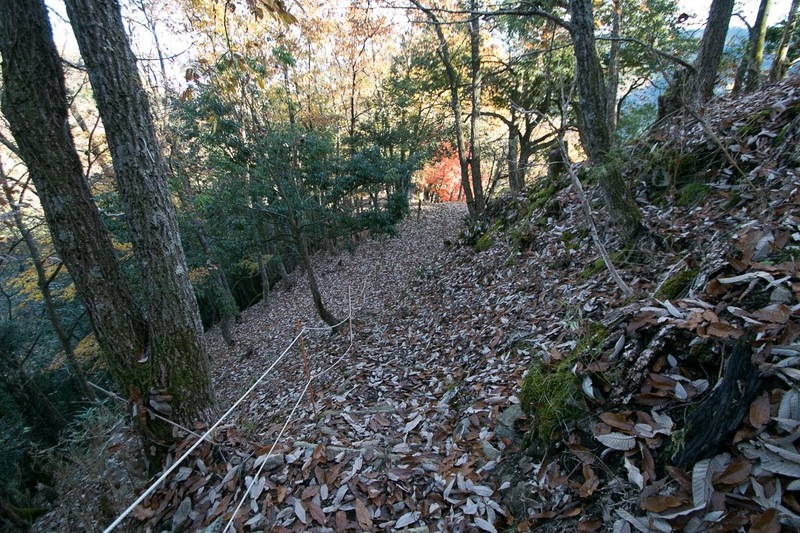 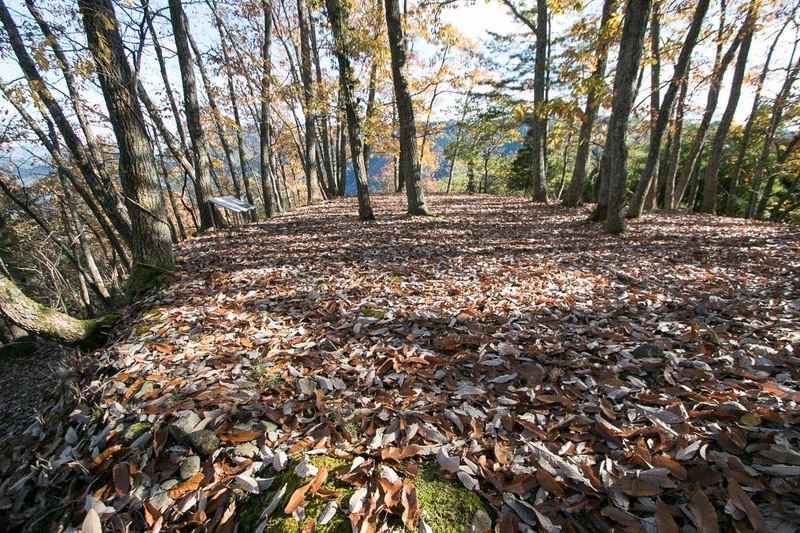 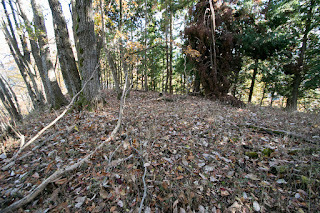 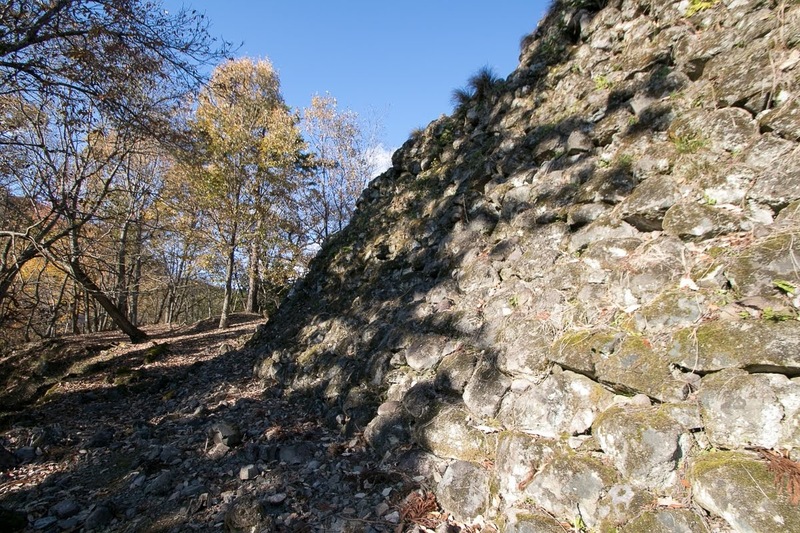 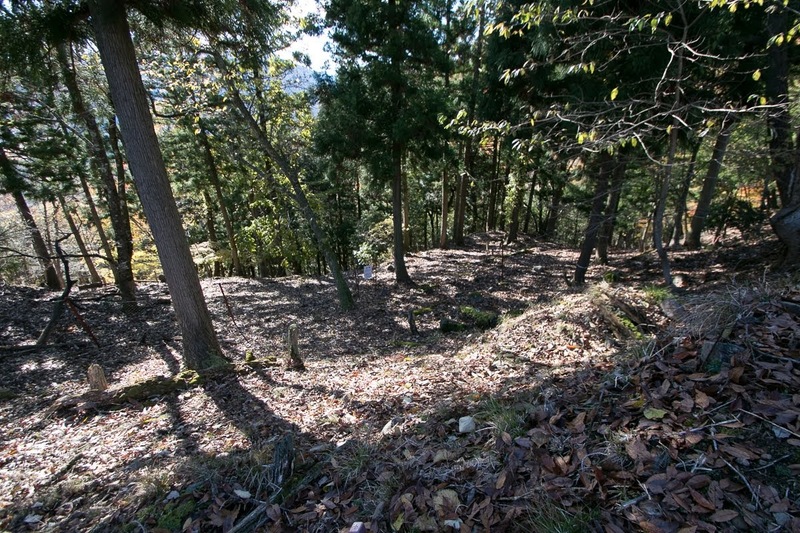 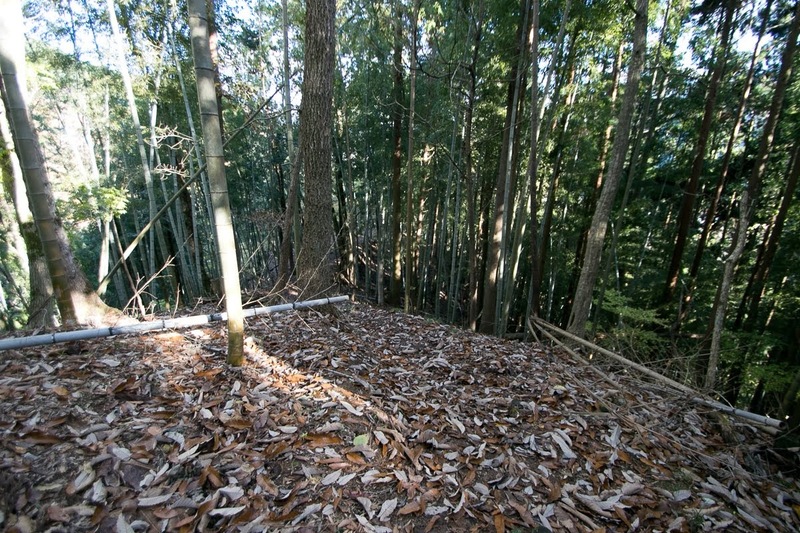 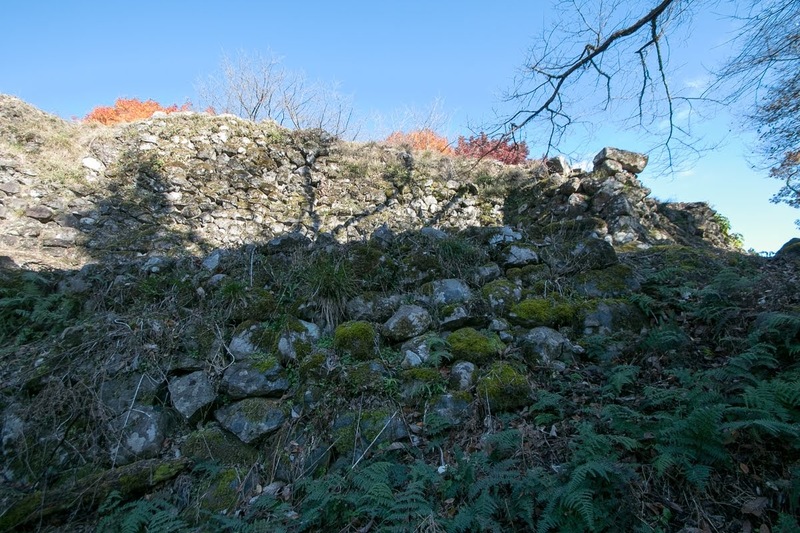 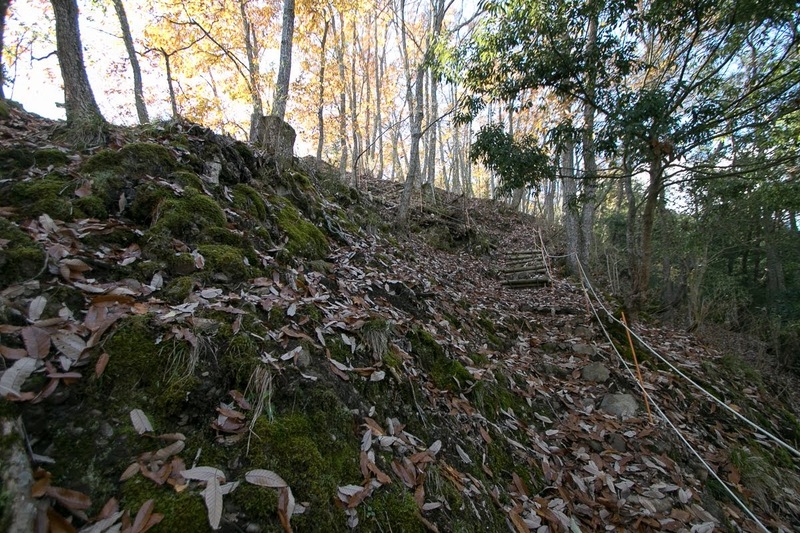 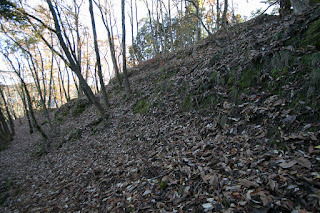 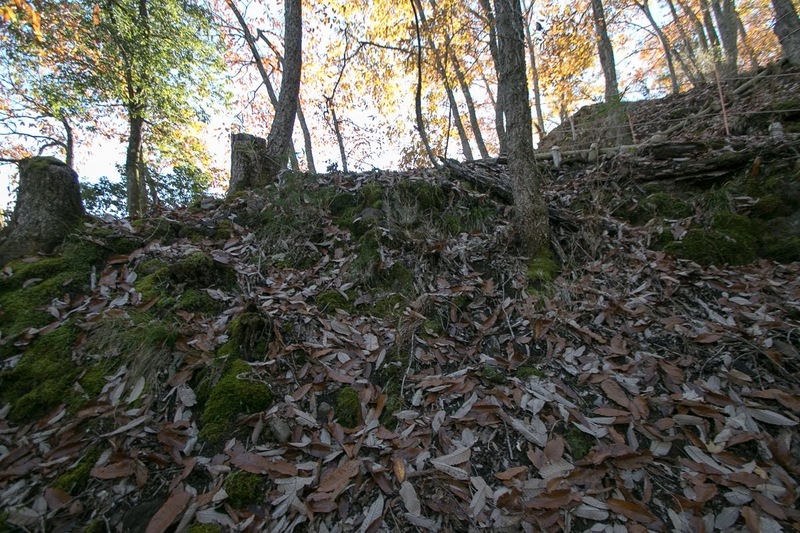 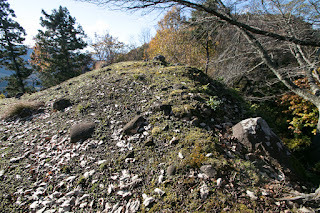 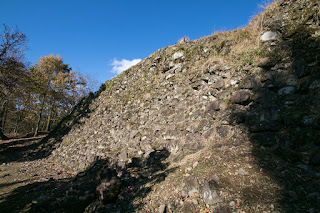 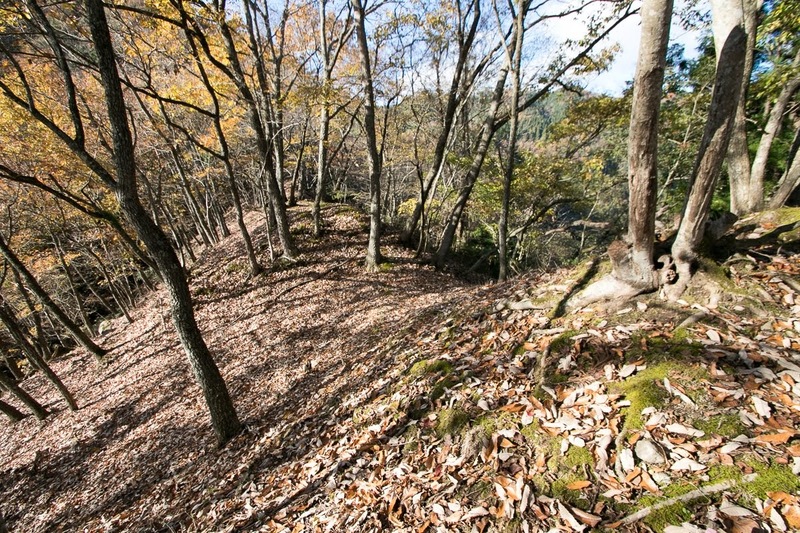 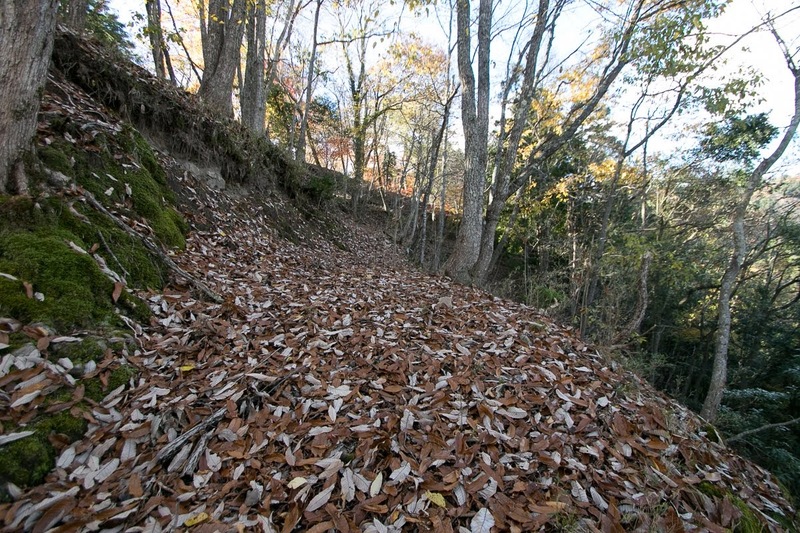 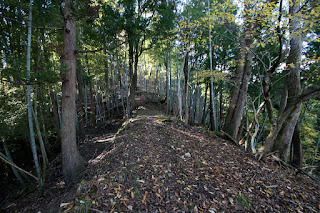 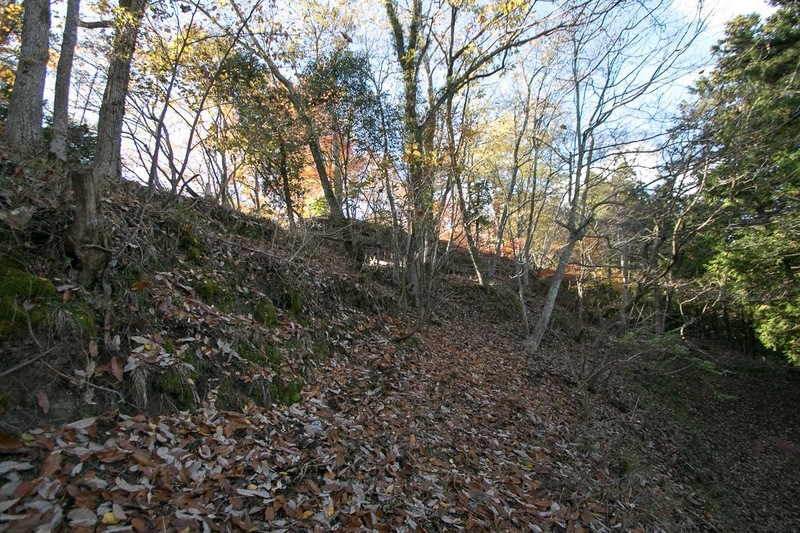 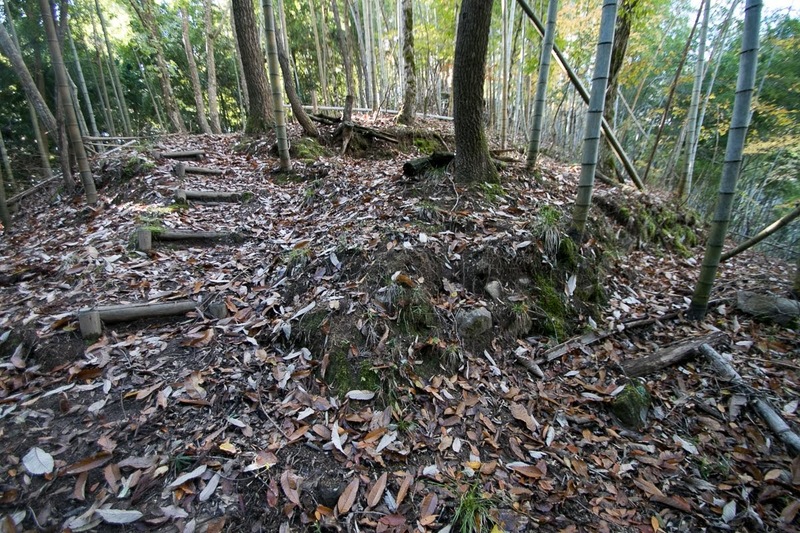 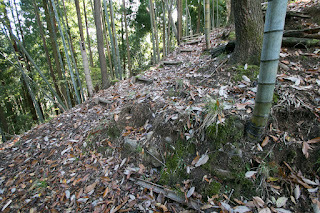 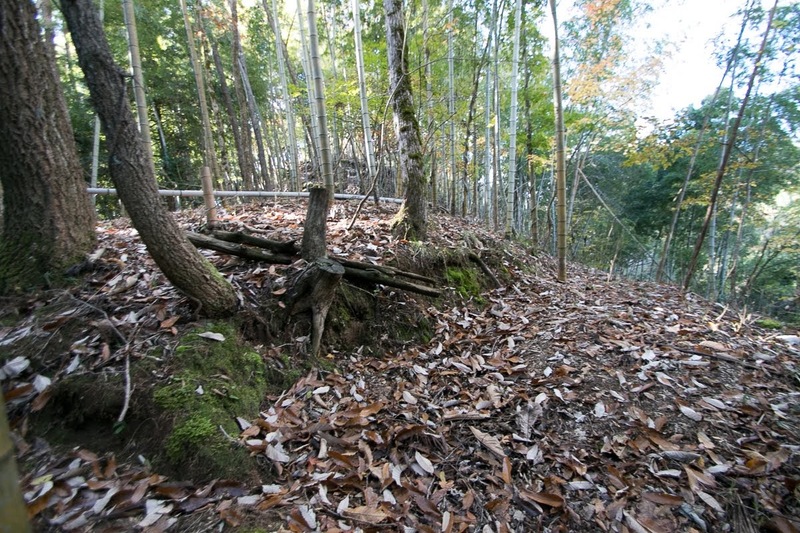 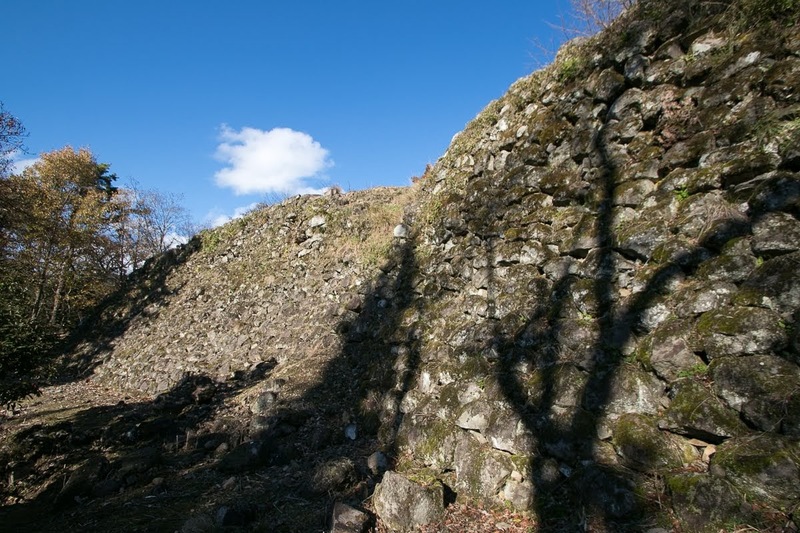 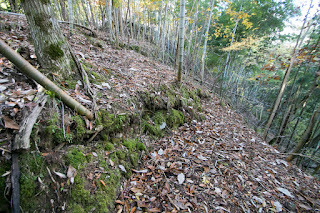 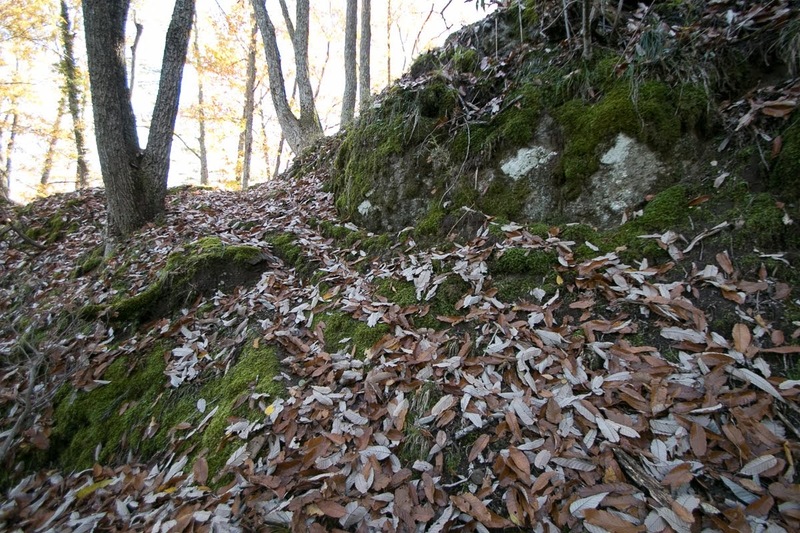 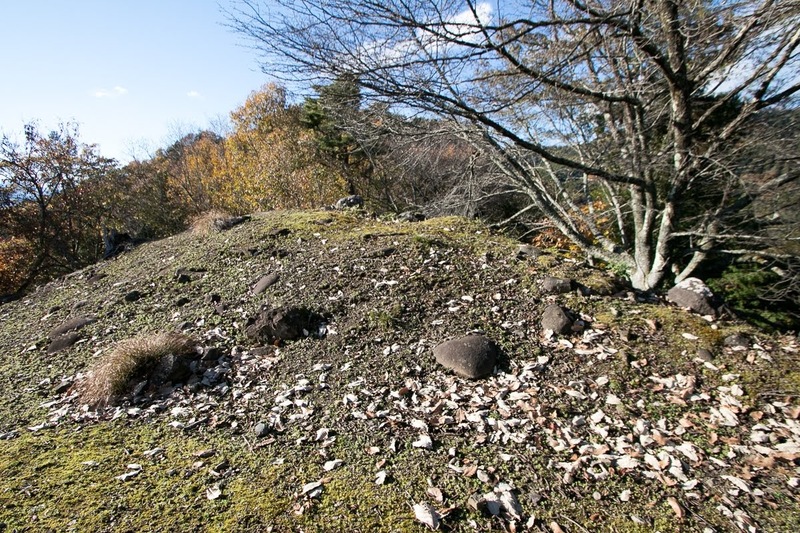 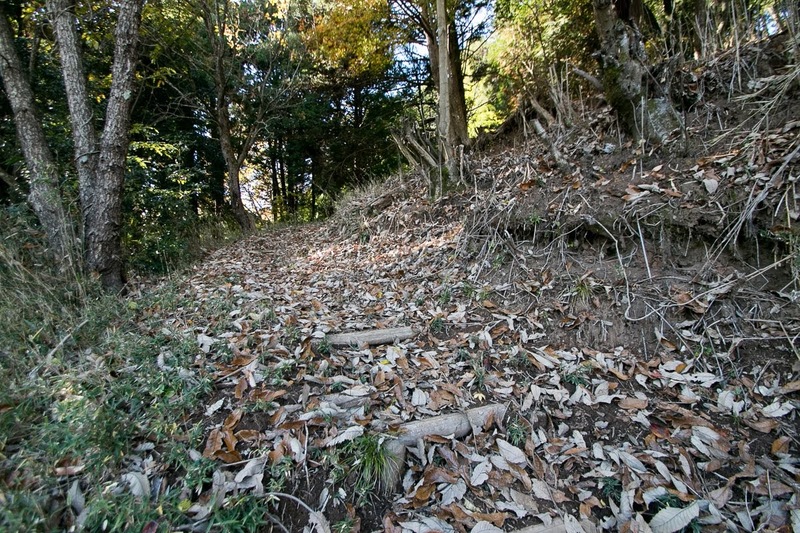 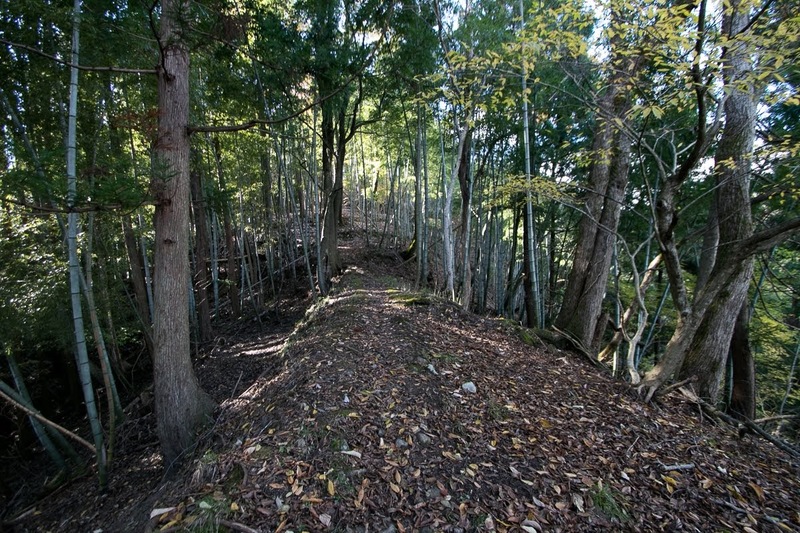 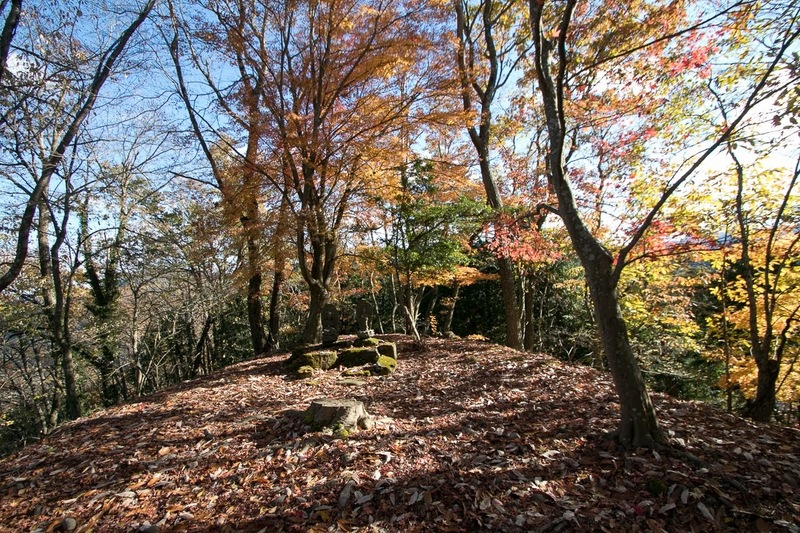 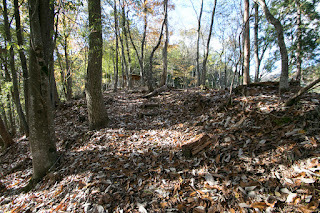 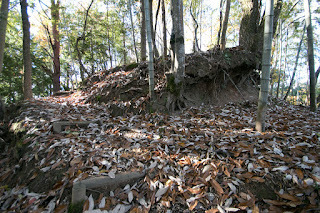 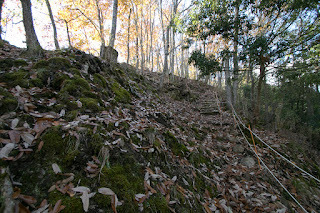 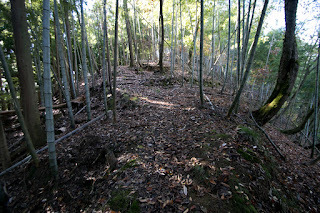 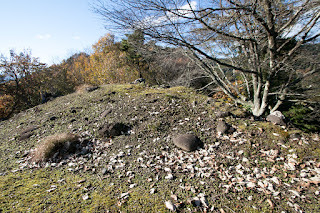 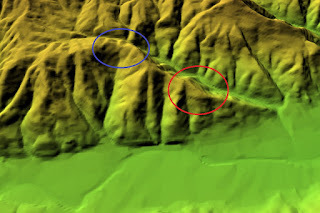 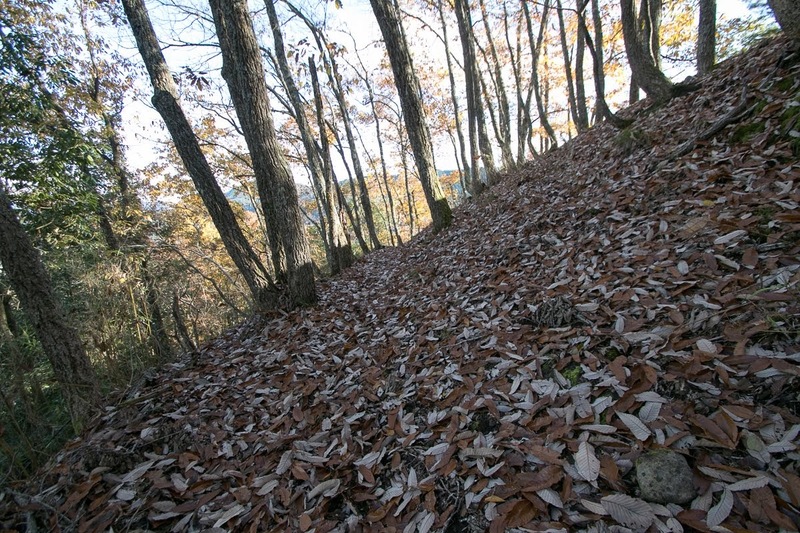 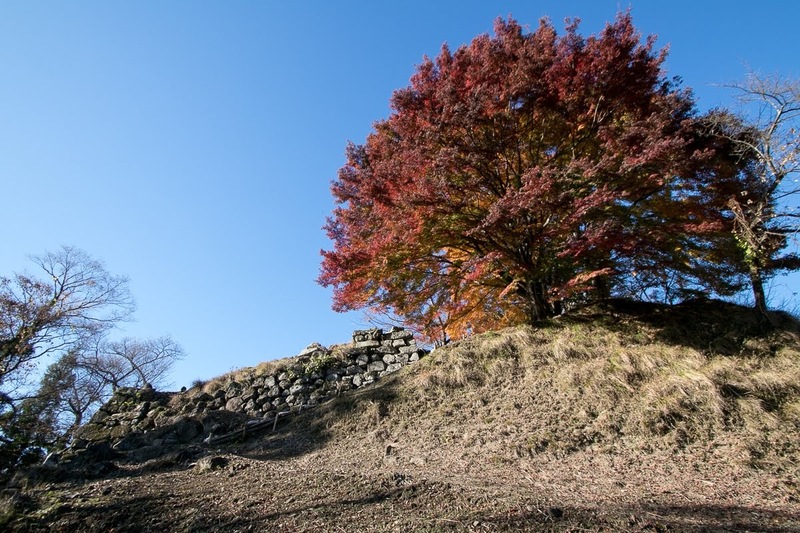 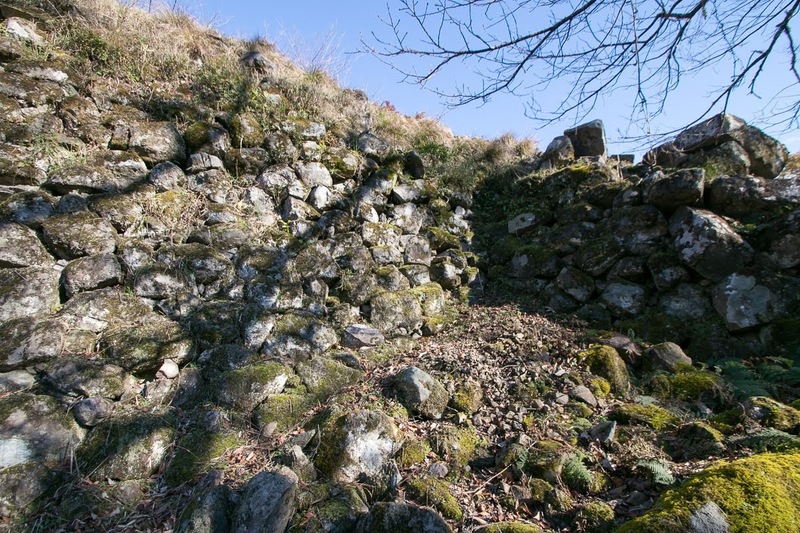 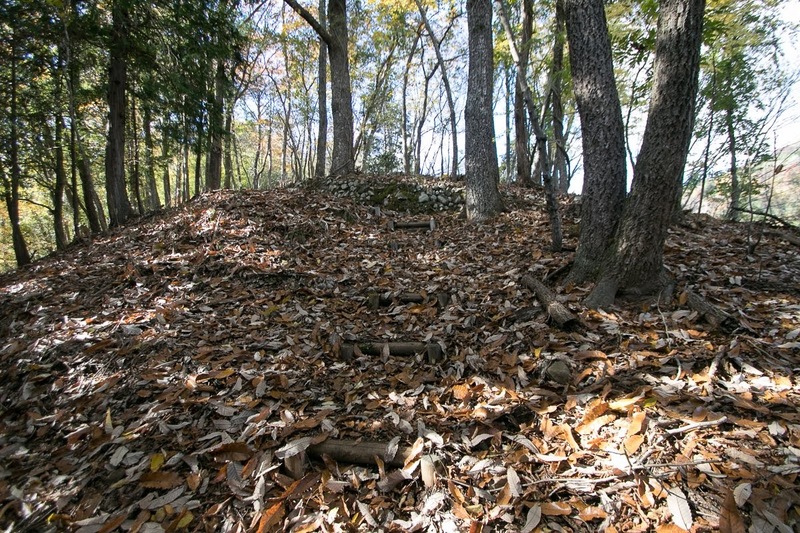 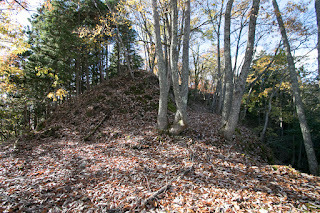 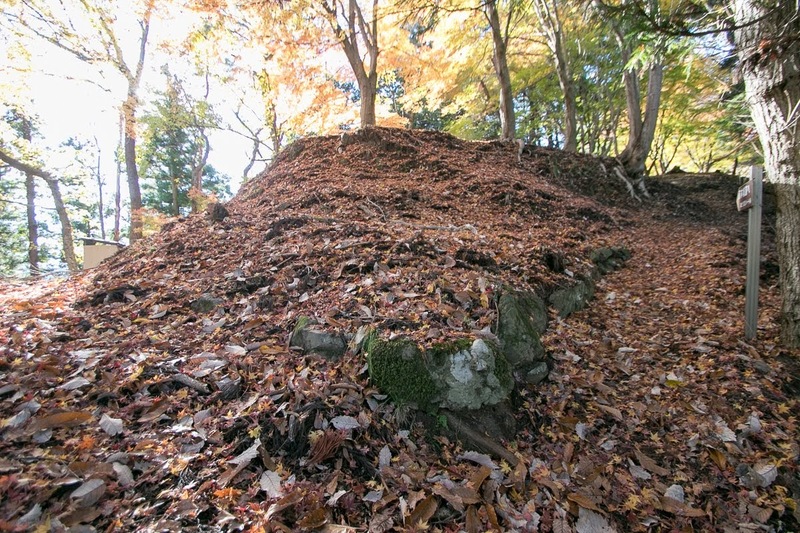 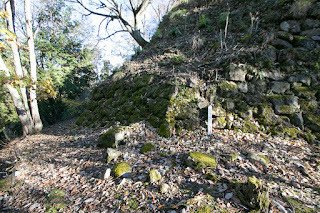 At 500 meter west of the central area, there is a ruin of old castle at the next peak of 100 meter higher. 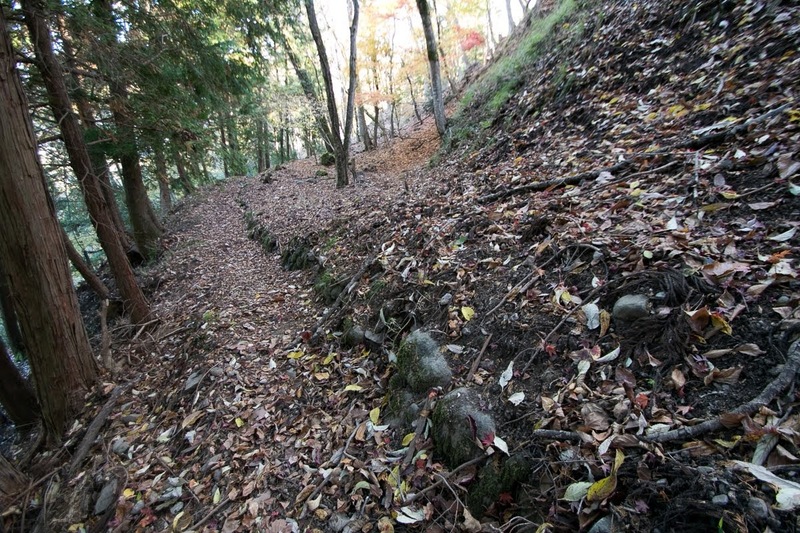 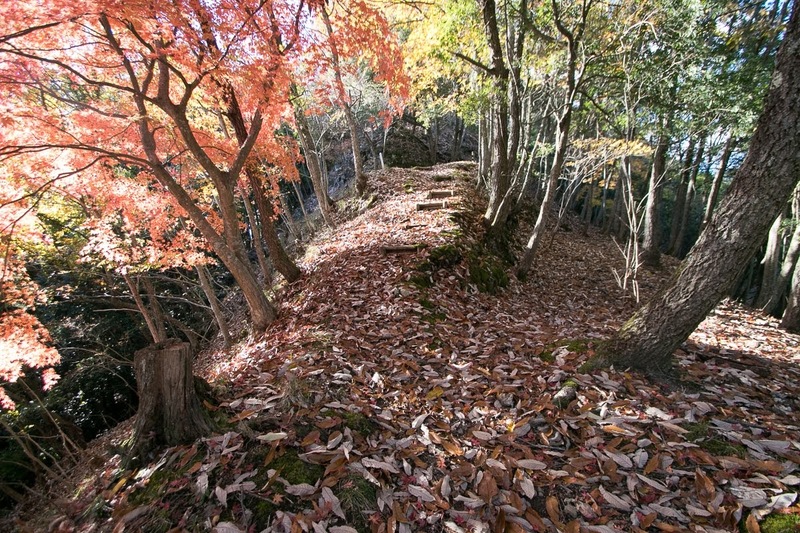 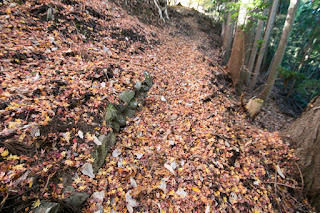 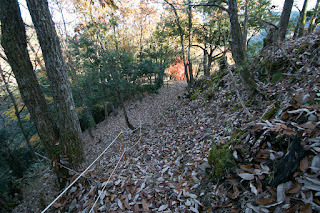 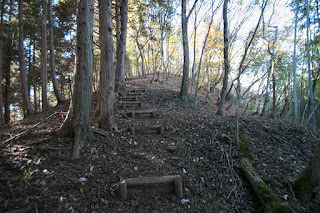 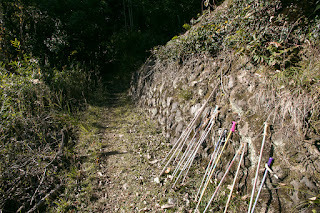 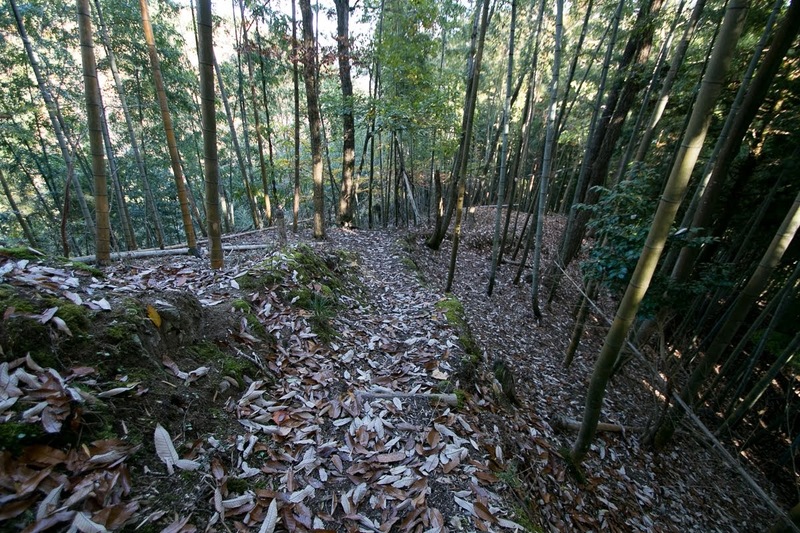 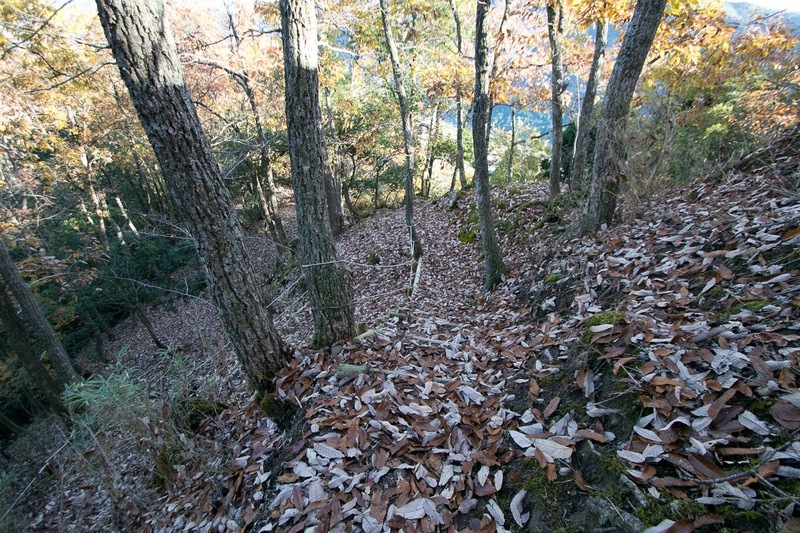 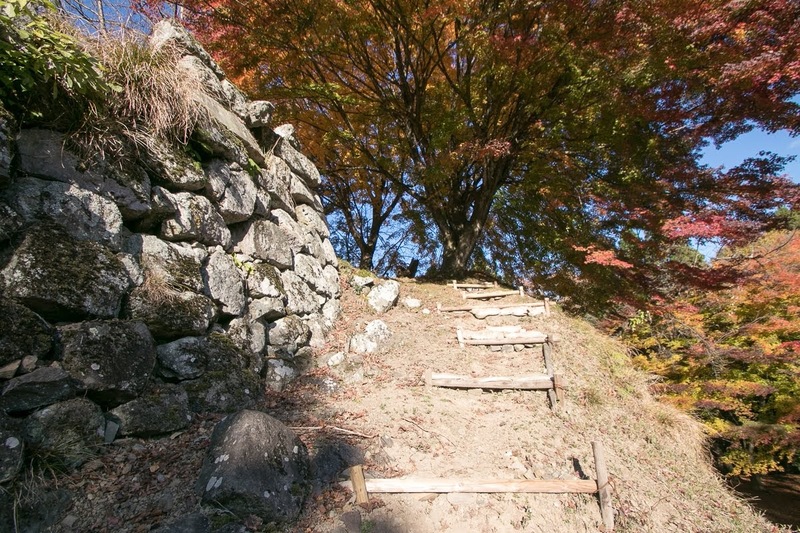 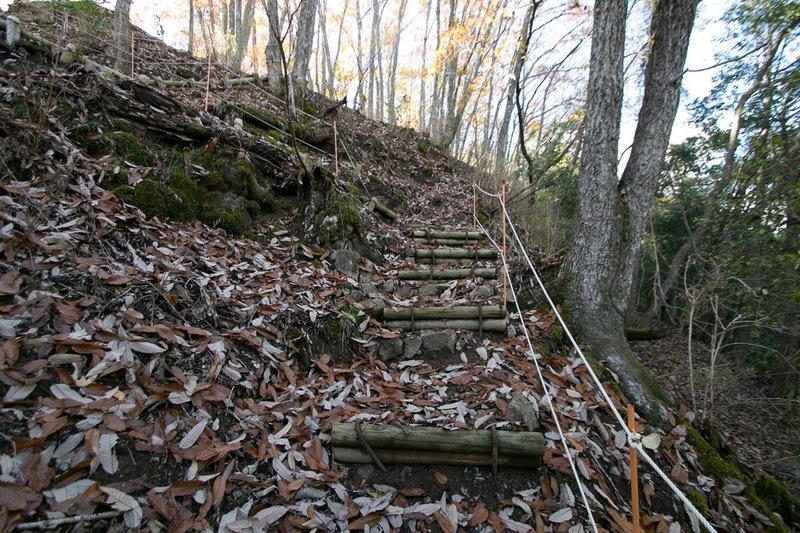 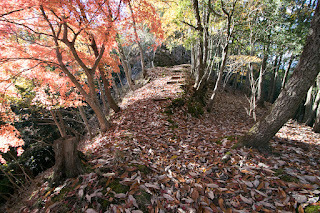 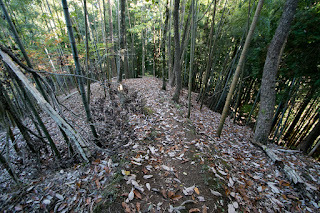 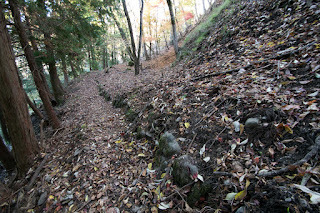 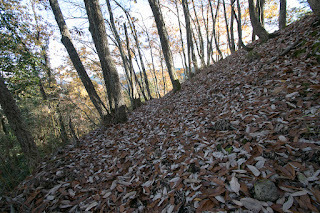 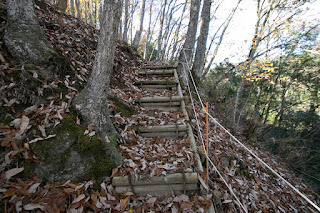 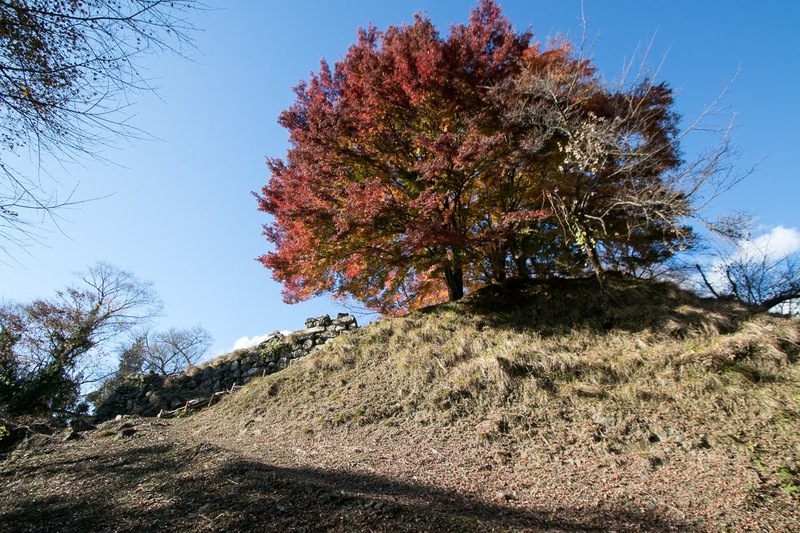 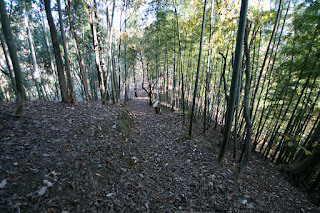 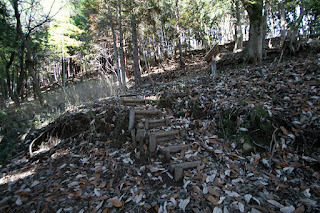 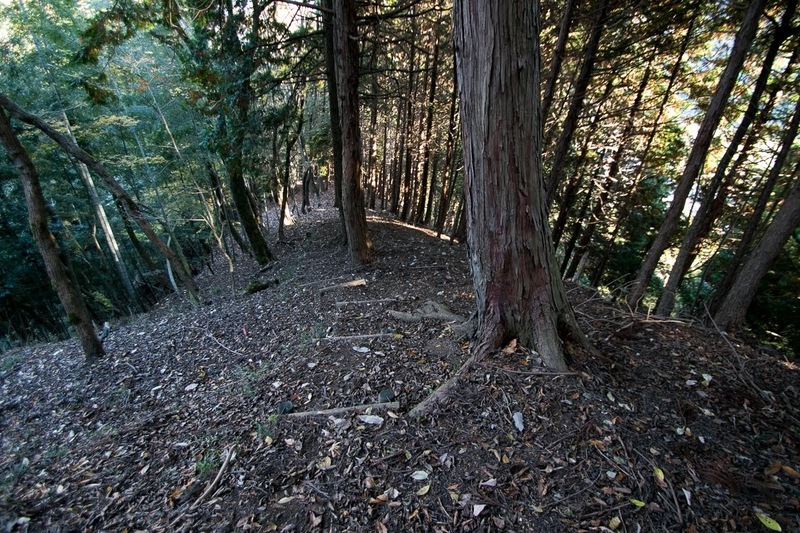 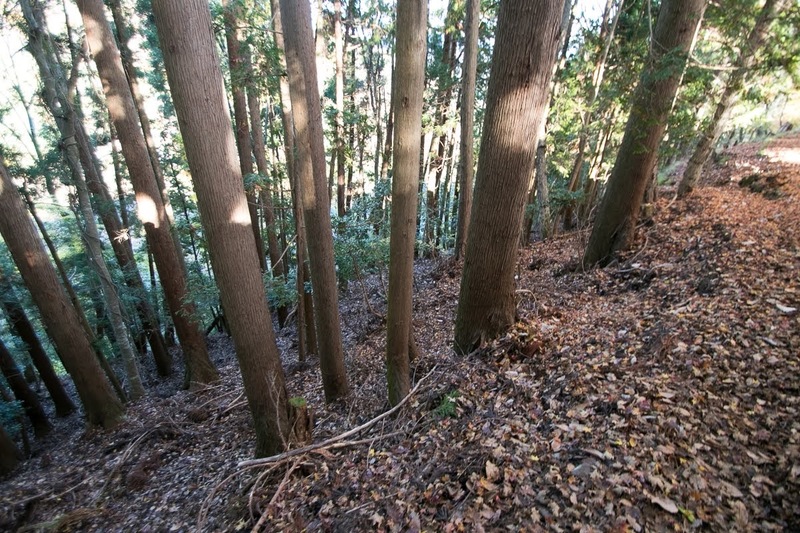 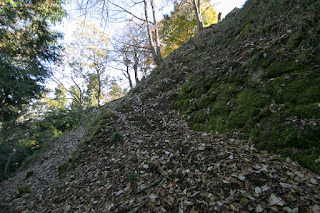 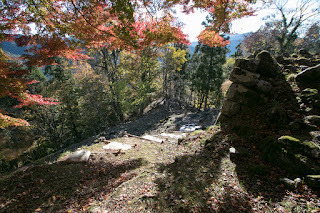 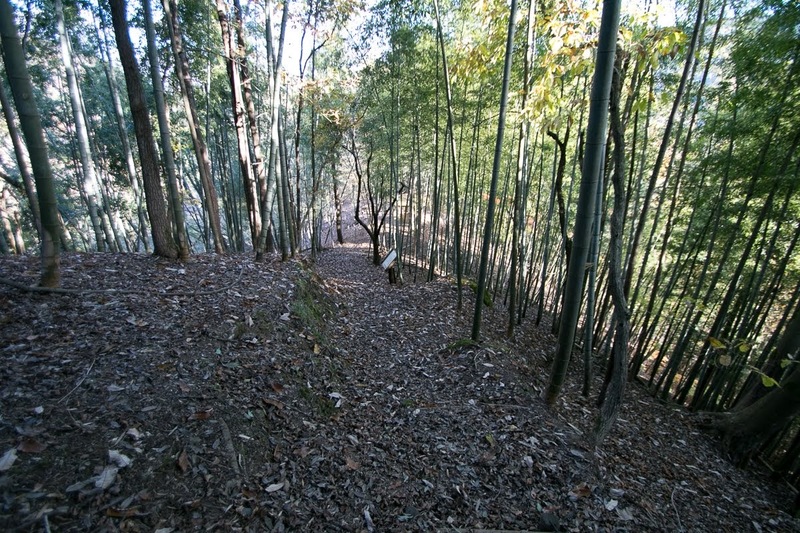 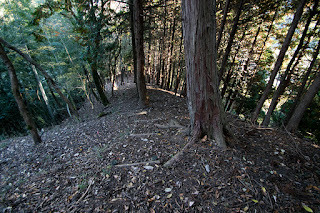 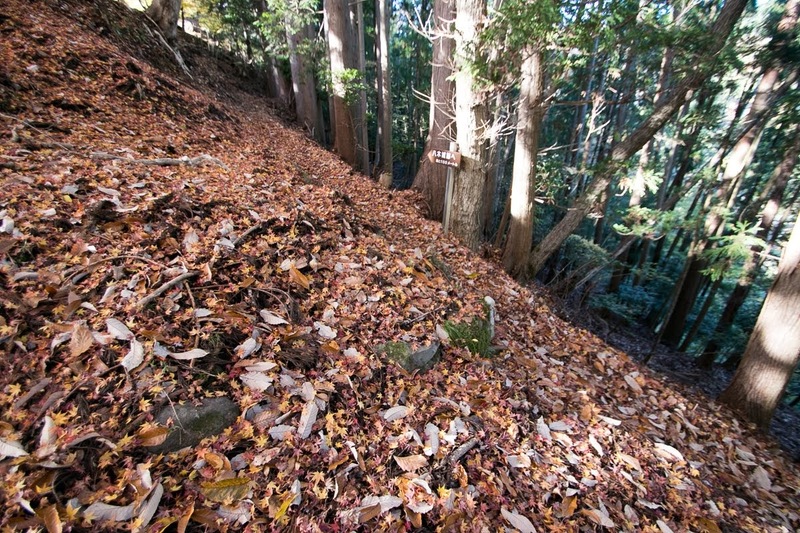 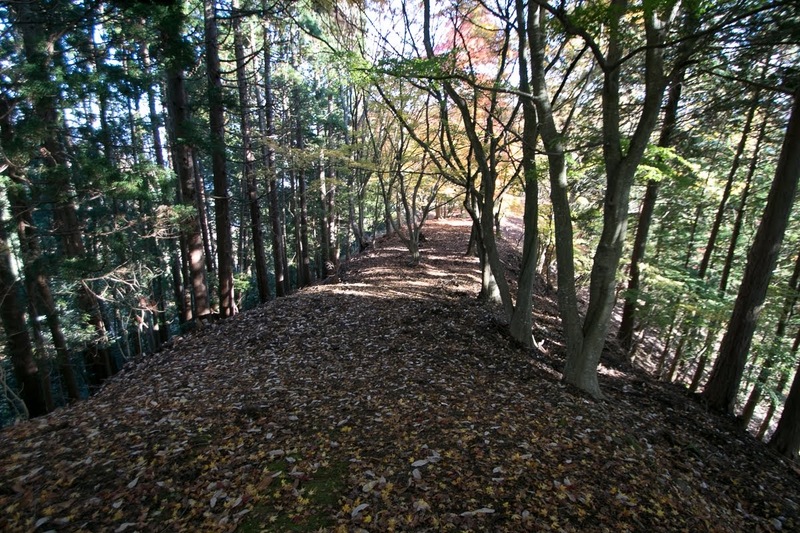 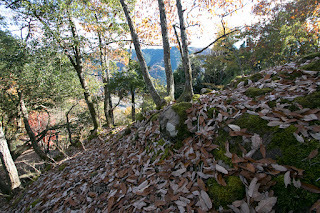 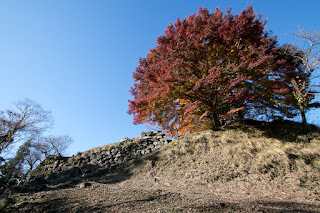 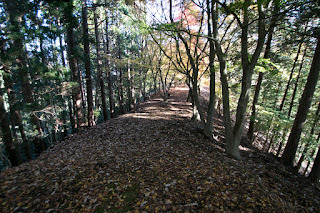 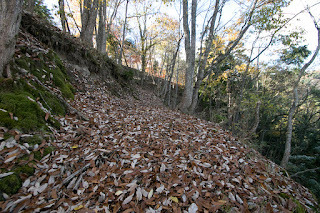 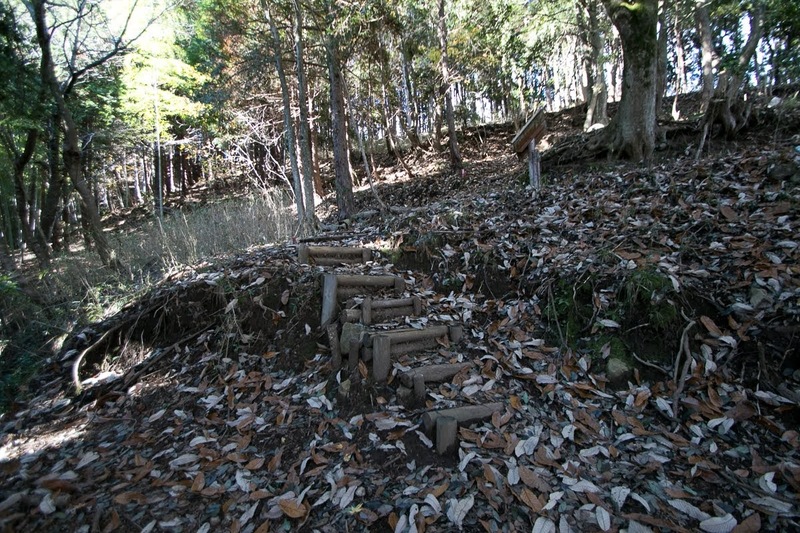 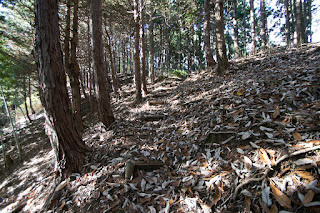 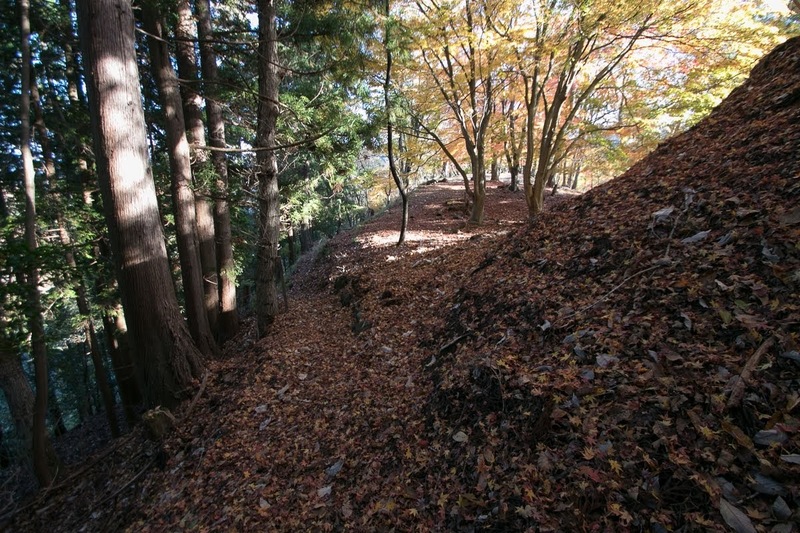 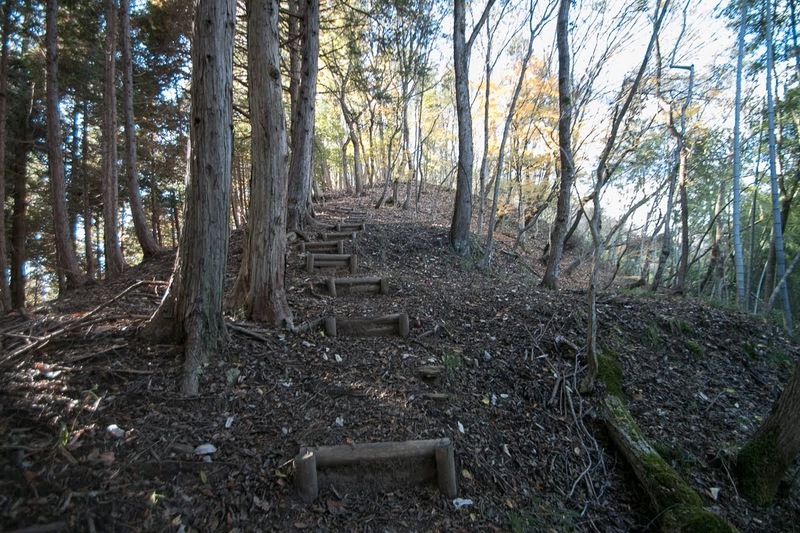 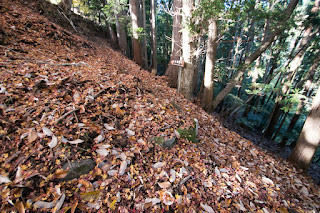 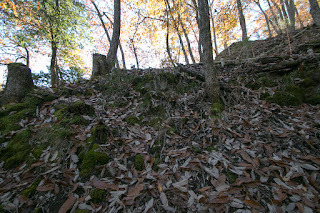 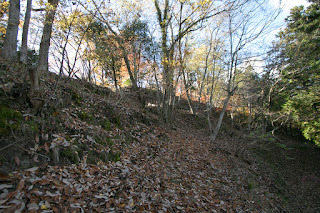 To reach the old castle, visitors has to climb steep slope over 200 meter. 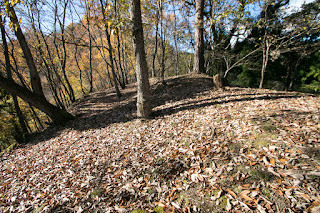 Old castle is a old style clay castle which has the line of terraces continues over the ridge in line, but tall clay wall and combine gate shows reform in later period. Originally Yagi castle and old Yagi castle was unitedly operated, but along with the arrival of peace period Bessho clan disposed inconvenient old castle and only used front side castle. 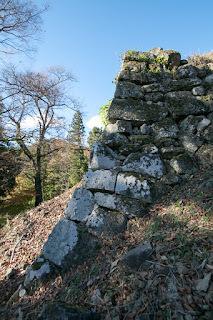 But period of Bessho clan did not last long. 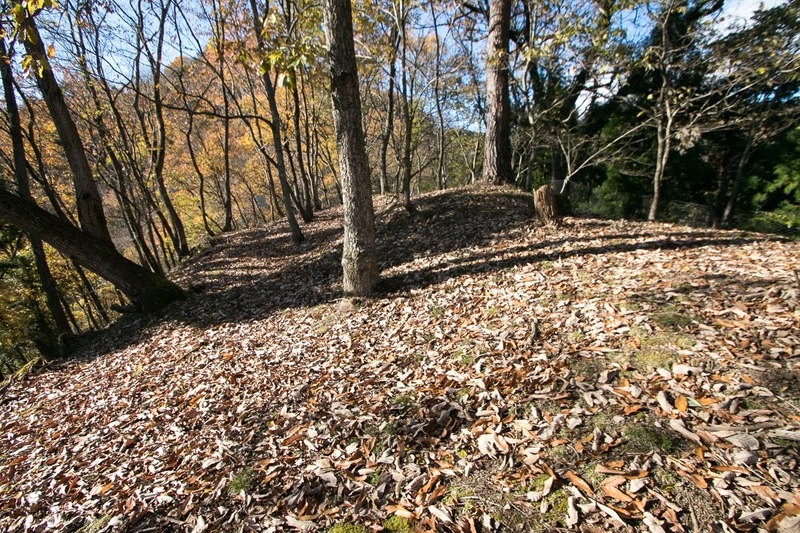 At the battle of Sekigaraha in 1600 between Ieyasu Tokugawa (1543-1616) and Mitsunari Ishida (1560-1600) after the death of Hideyoshi, Yoshiharu Bessho (1579-1654), son of Shigemune, supported Mitsunari and attacked Tanabe castle held by Fujitaka Hosokawa (1534-1610), along with Hirohide Akamatsu (1562-1600) who was the lord of Takeda castle (Hyogo prefecture). 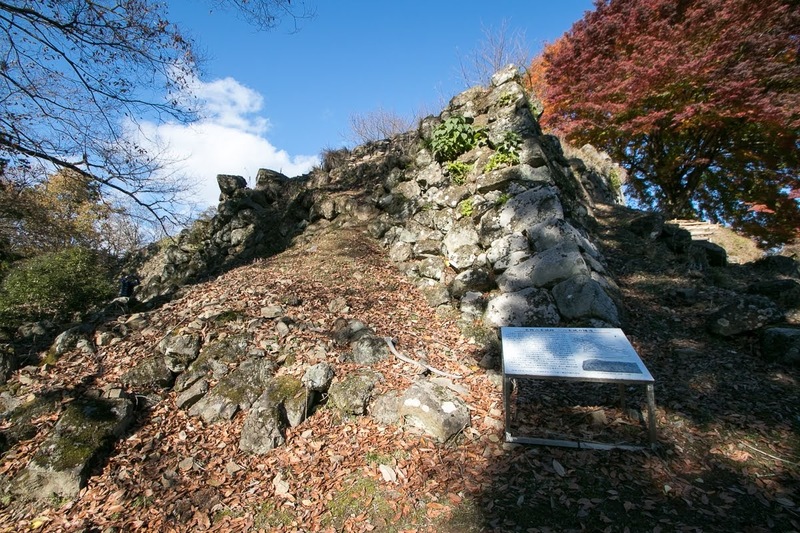 But after the defeat of Mitsunari, Yoshiharu and Hirohide turned to Ieyasu, and attacked Tottori castle (Tottori prefecture). 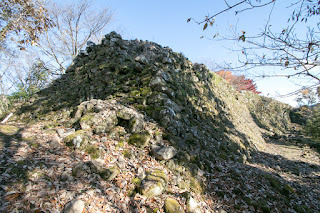 At this attack Yoshiharu and Hirohide burnt castle town of Tottori castle, but later Hirohide was accused for this action and forced to suicide. 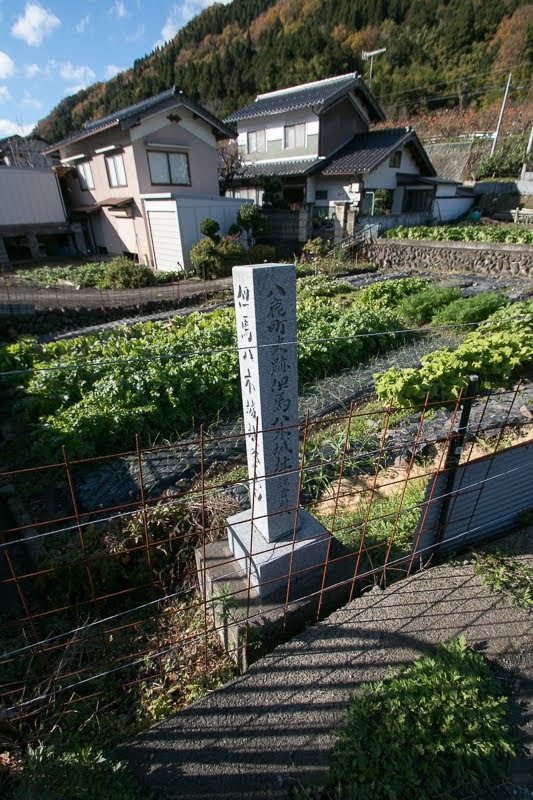 Yoshiharu was once forgiven because his aunt was a nanny of Hidetada Tokugawa (1579-1632), but finally was expelled in 1628, because of negligence of attendance to Edo city. 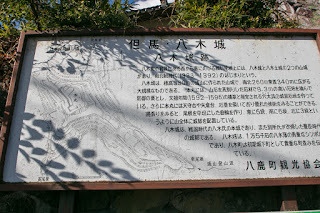 Near Yagi castle there was a Nakase gold mine, and it is thought that this expulsion was to deprive the right of gold mine, same as Hirohide Akamatsu who held Ikuno silver mind. Yagi castle was abolished at this time. 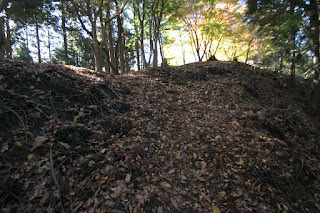 Currently there was no building but the shape of the castle was well kept on the mountain. 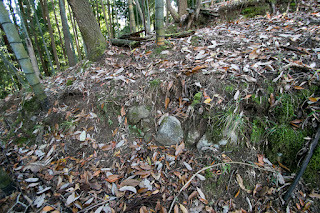 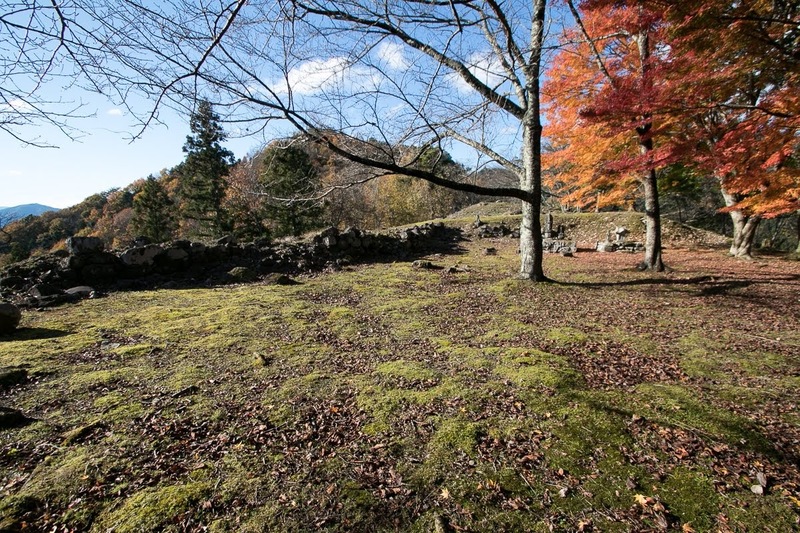 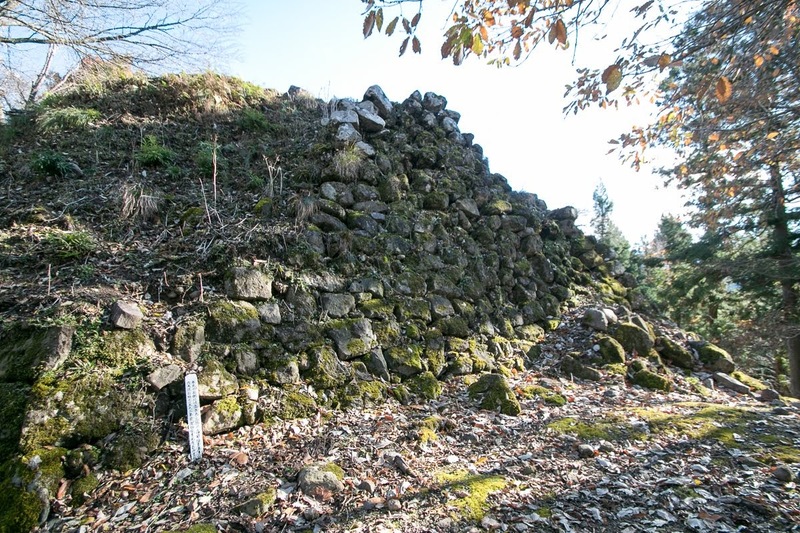 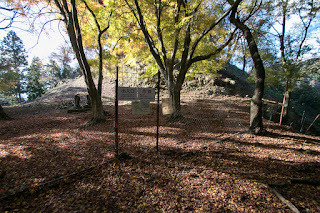 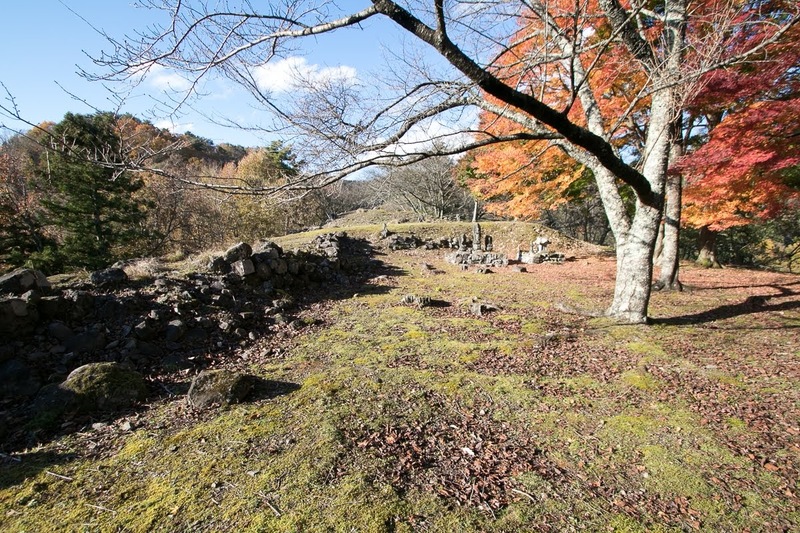 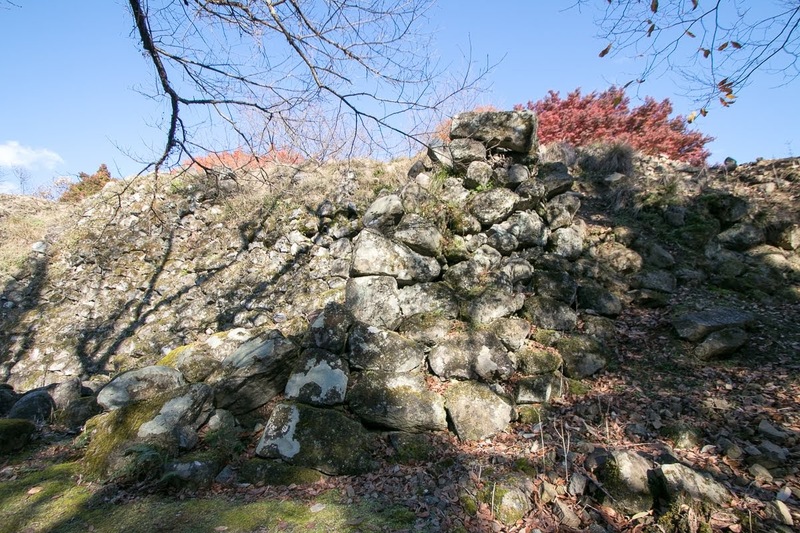 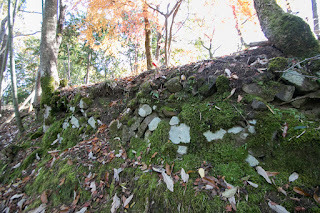 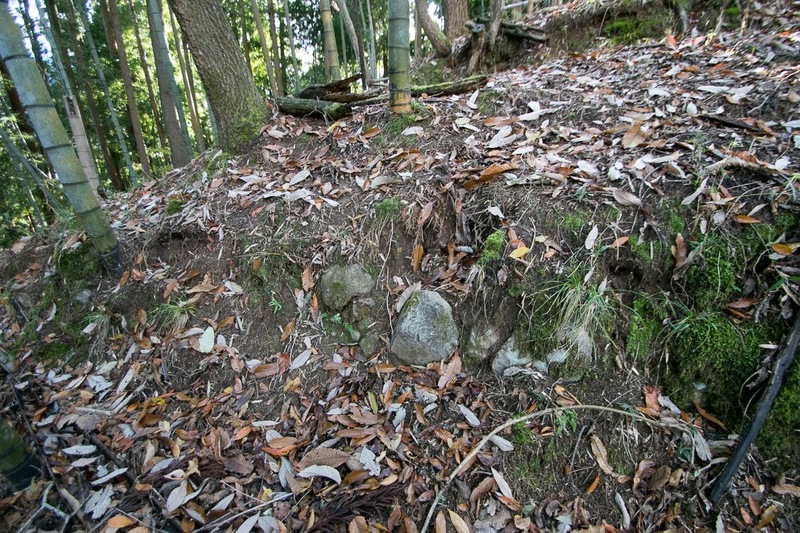 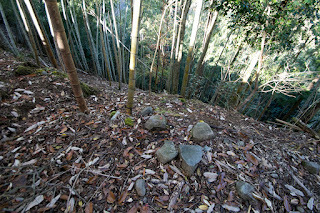 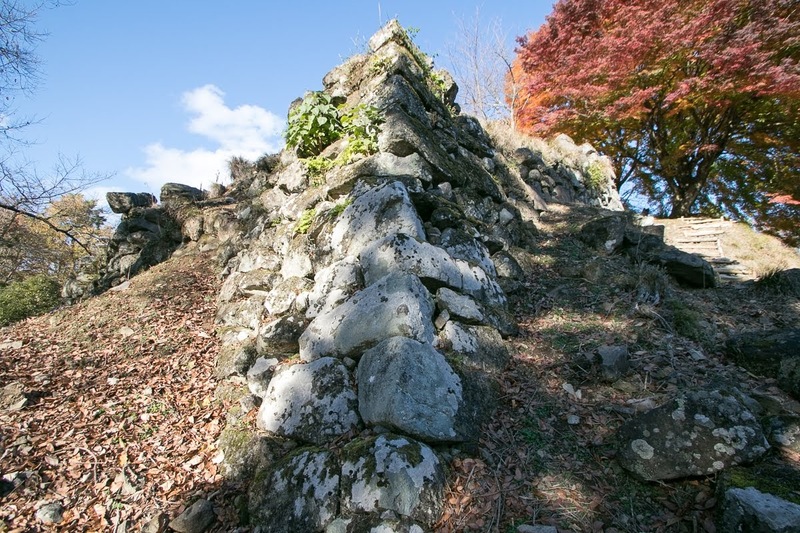 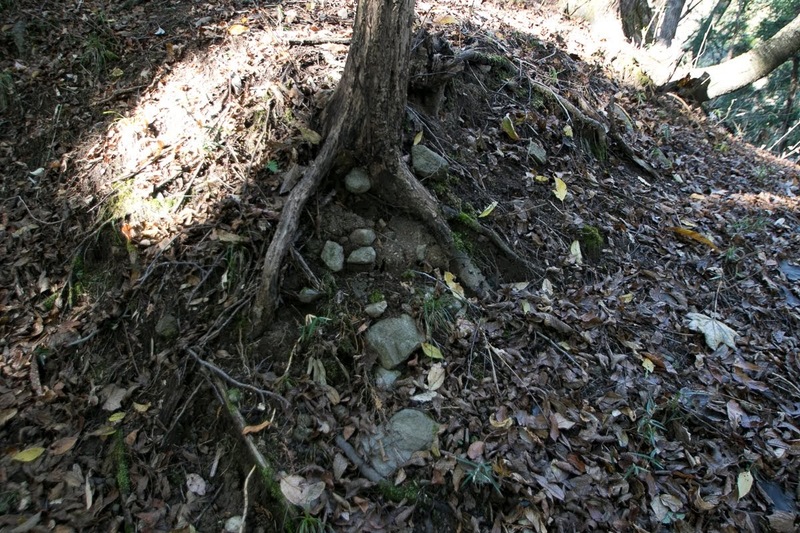 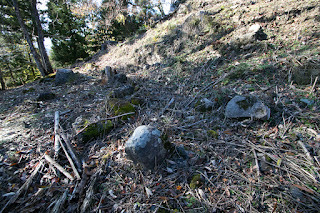 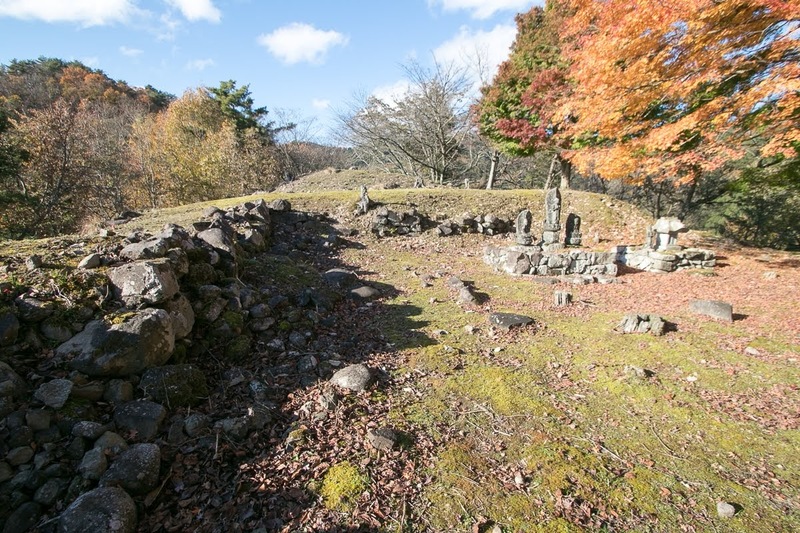 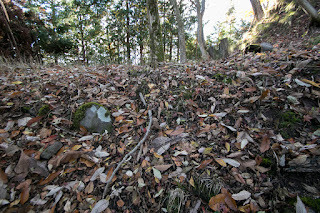 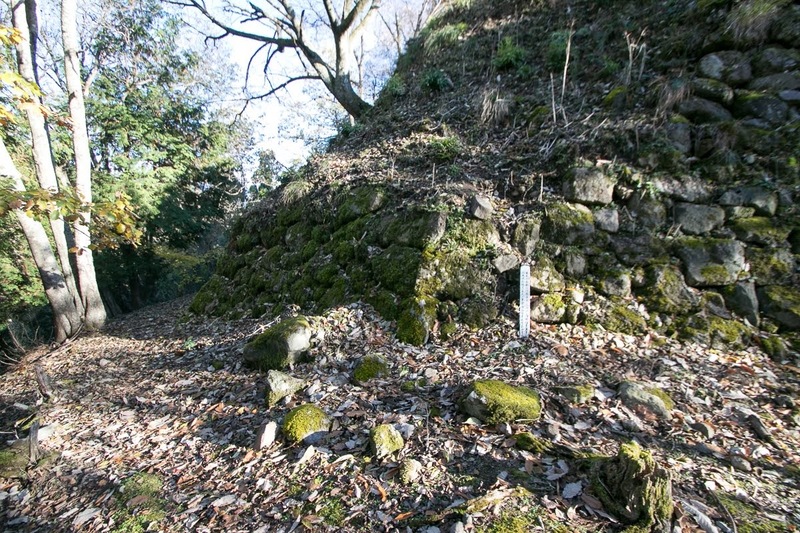 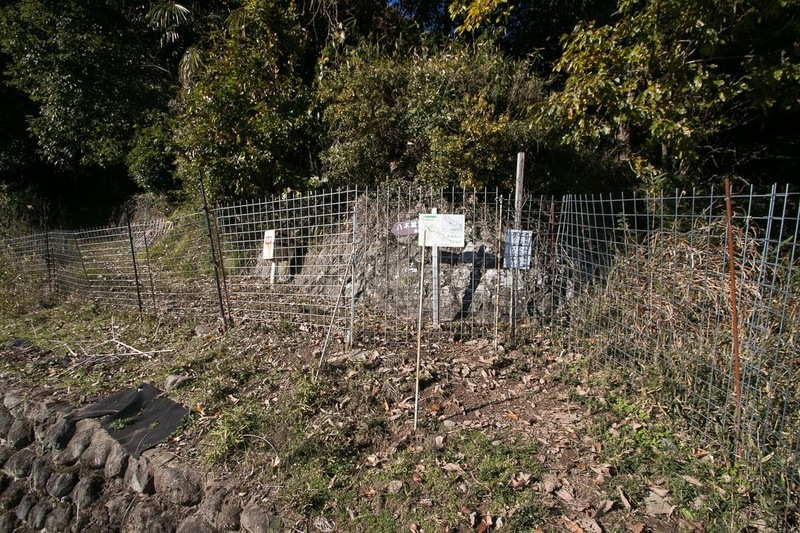 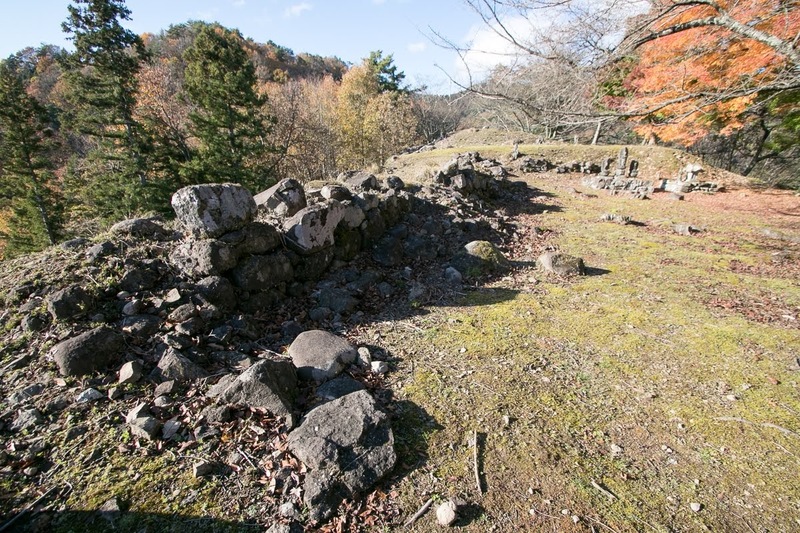 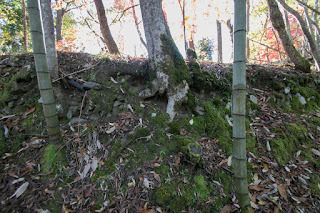 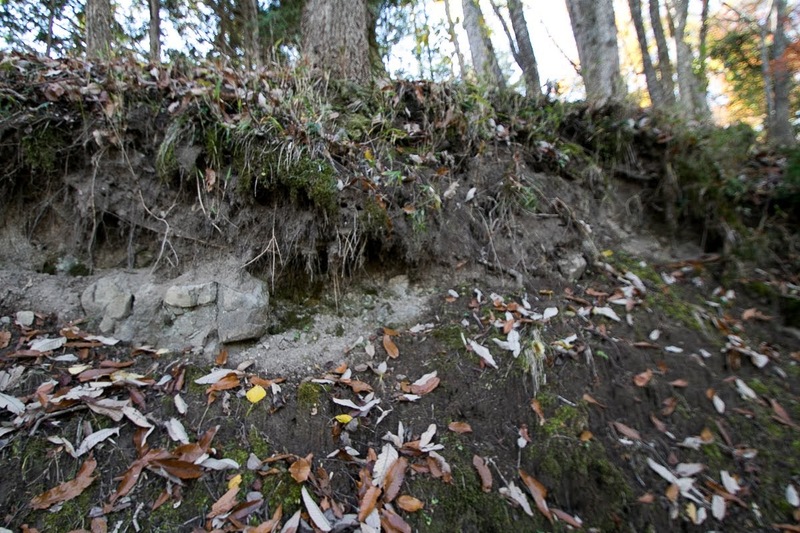 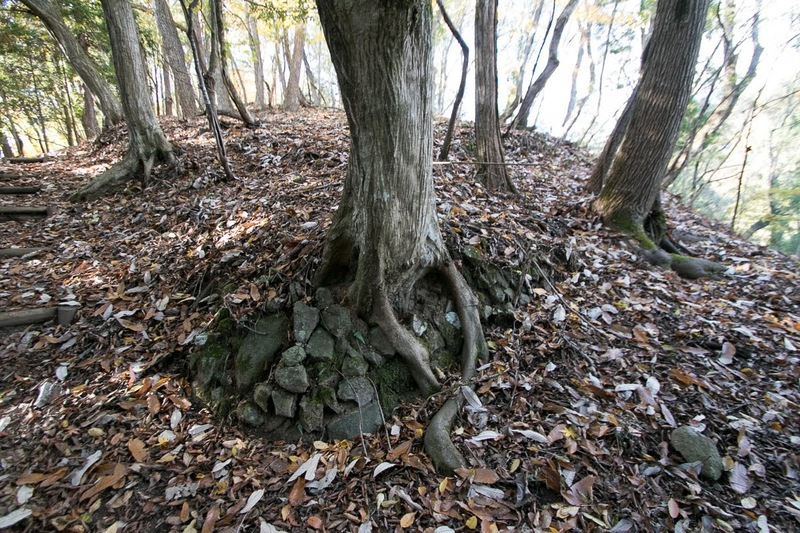 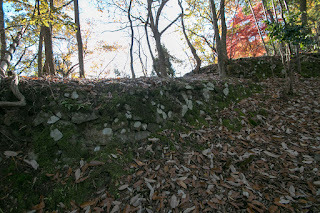 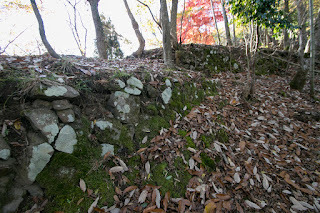 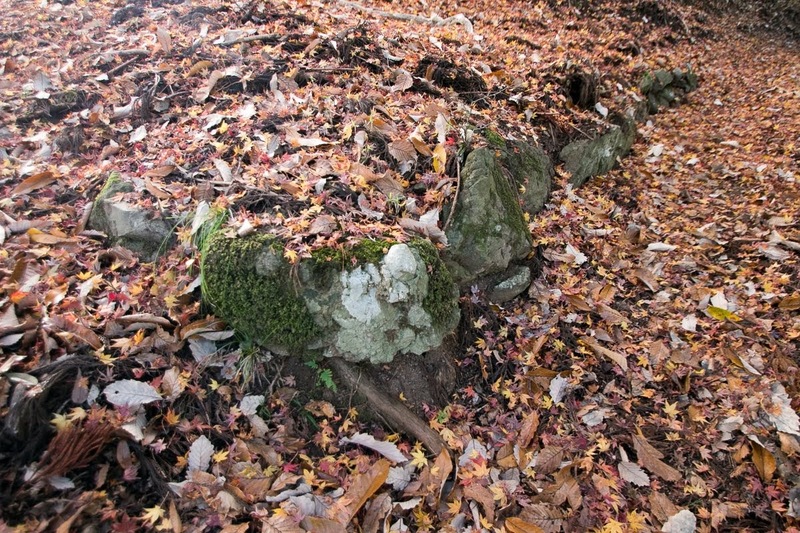 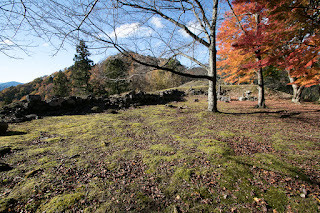 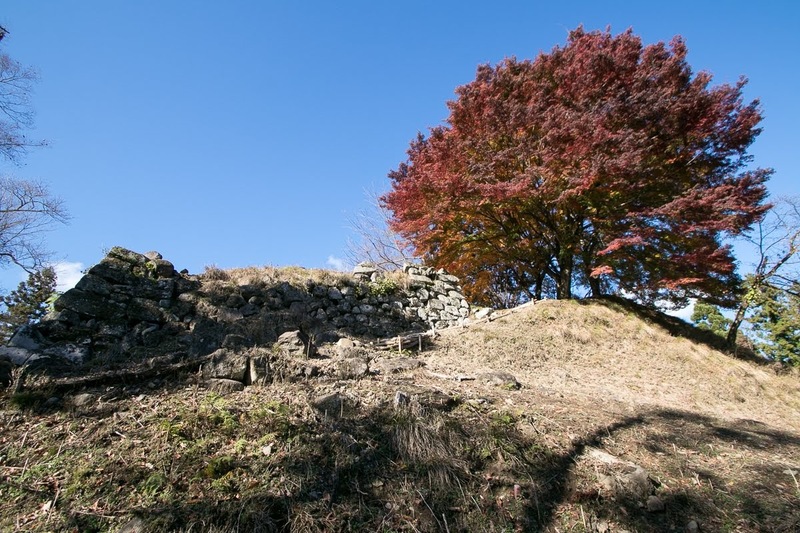 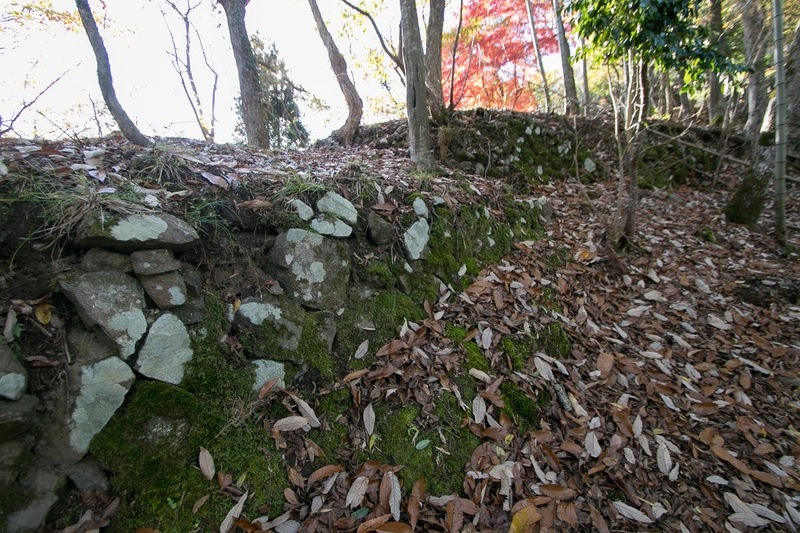 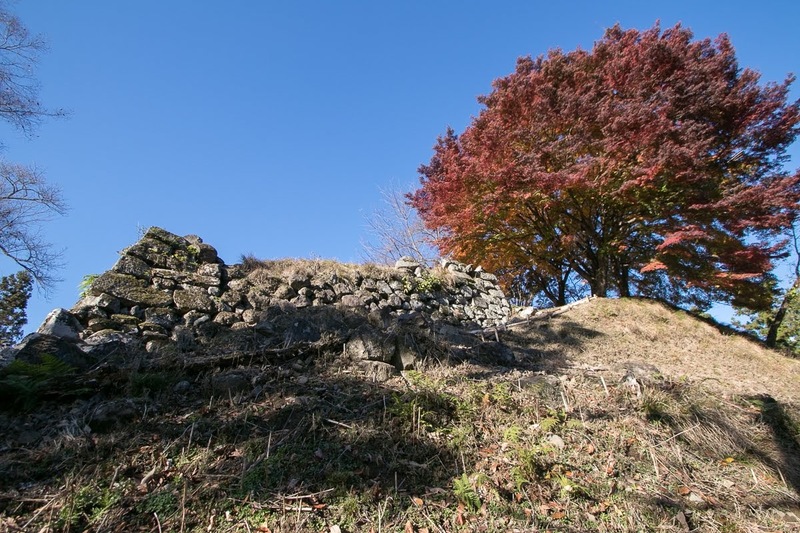 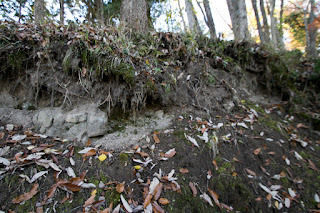 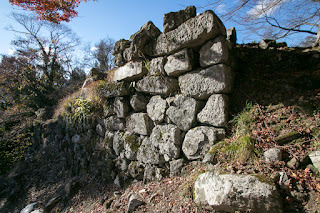 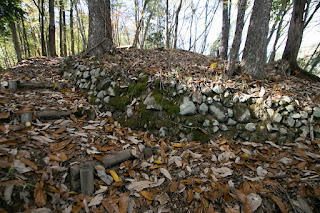 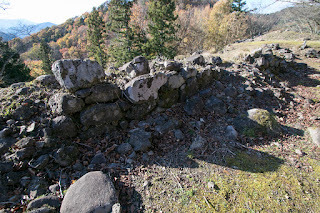 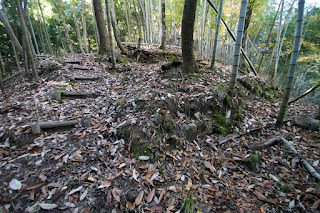 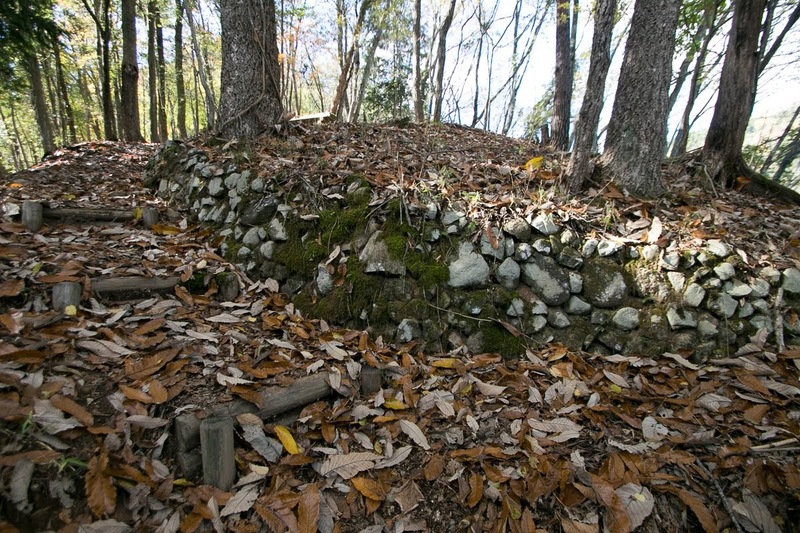 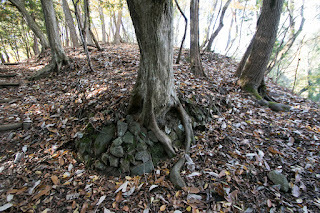 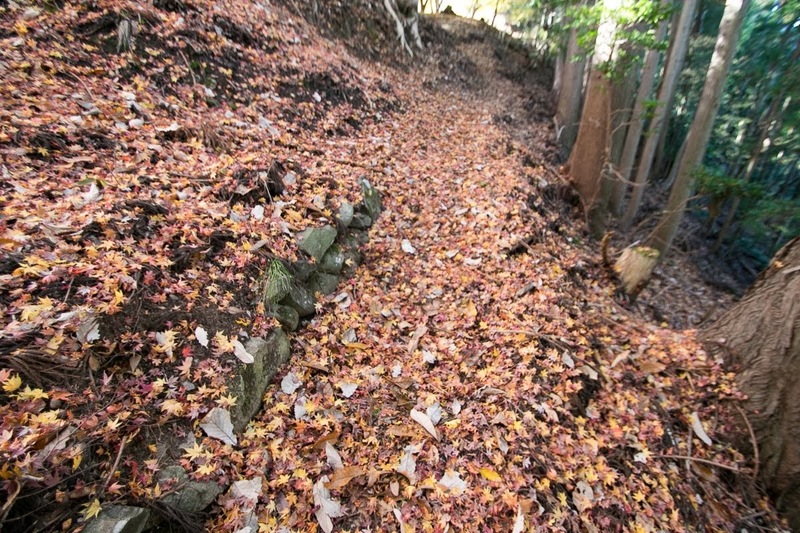 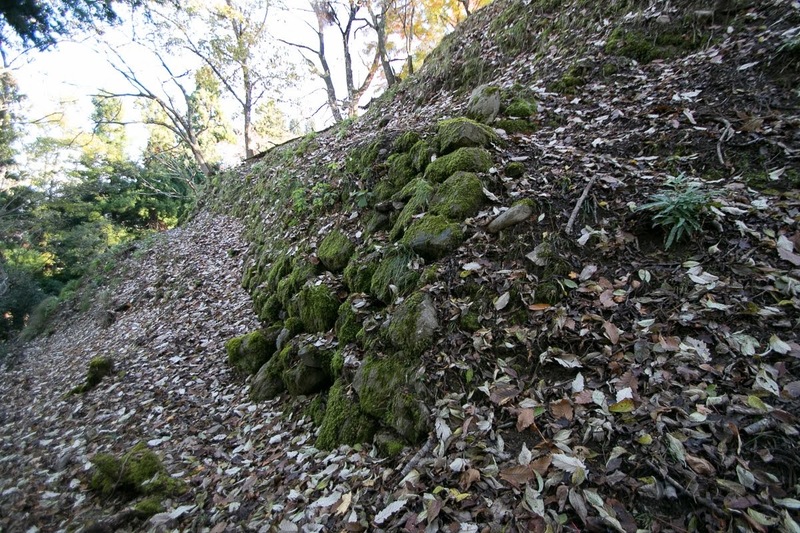 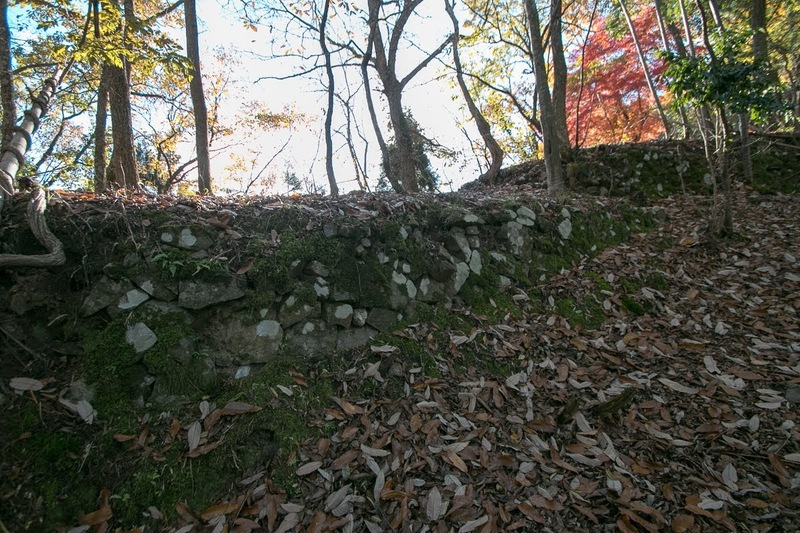 Partially built stone walls shows mortification of Bessho clan which could not survive as a feudal lord by a hair's-breadth fate. 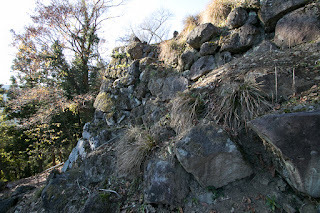 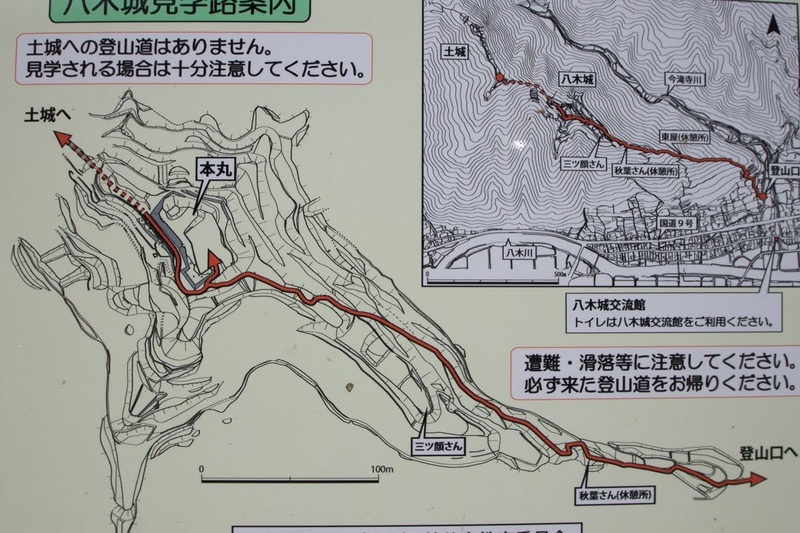 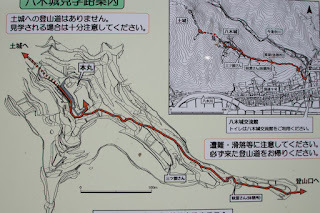 As entrance to the castle and climbing route is not clear and visitors are recommended to get information in advance.